Already as a child I had to learn a truth about life, that everything has an end. It is always very sad for me to finish a bag of “Basler Leckerli”, my favourite biscuits, but on the other side it is nice to finish a work day in order to follow my leisure time activities. 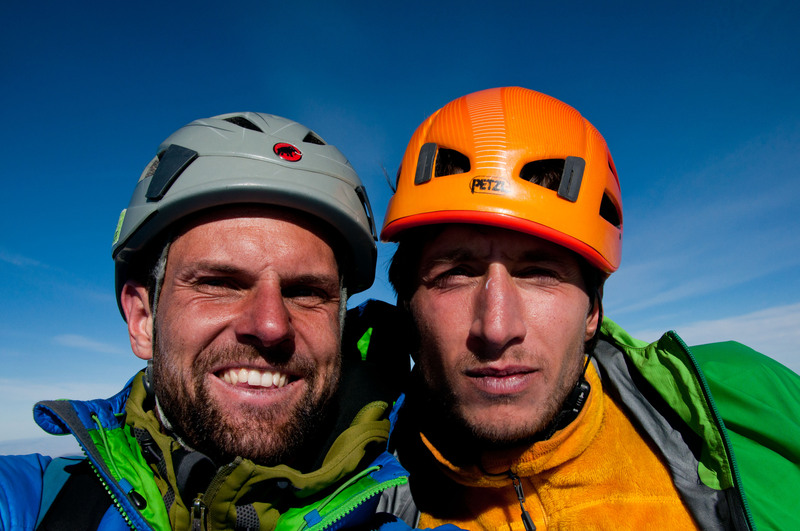 Together with Louis we had the chance to spend half a year living our dream, travelling a new continent and seeing it from the sky, climbing fantastic routes and standing on high summits, discovering hidden places and sleeping under a new sky full of stars. We visited colourful Peru, with bustling markets, chaotic cities, high mountains, excessive glaciers and perfect though cold waves. We toured through extreme Chile, with perfect cracks in the dryest desert in the world and with overgrown cracks in the jungle version of Yosemite in Cochamo. 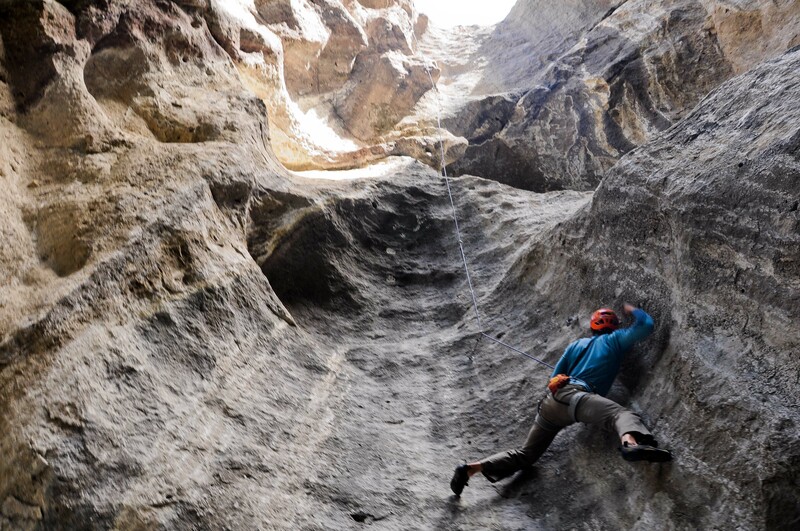 And finally we fell in love with diversified Argentina, from the tradclimbing paradise Arenales to the extreme walls and weather conditions of Patagonia. At this point we want to thank our readers for their interest, their contributions and their patience. I hope that you enjoyed our trip as much as we did and that you forgot the horizontal world the time of reading about our adventures. Our trip has come to an end, but an end is at the same time the beginning of something new… Let us see what it will be for us! So Long, and Thanks for All the Rock! 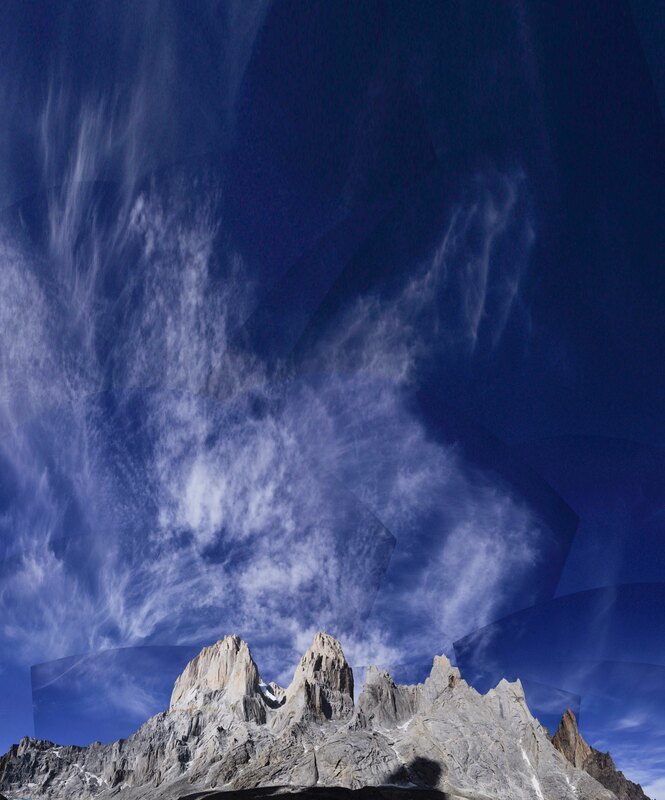 Fitz Roy: Do. Or Not Do. There Is No Try. Because of the frequent snowfalls during the first half of December, some ice/mixed routes of the massif were in unusually good conditions at the end of December i.e. late for the season. 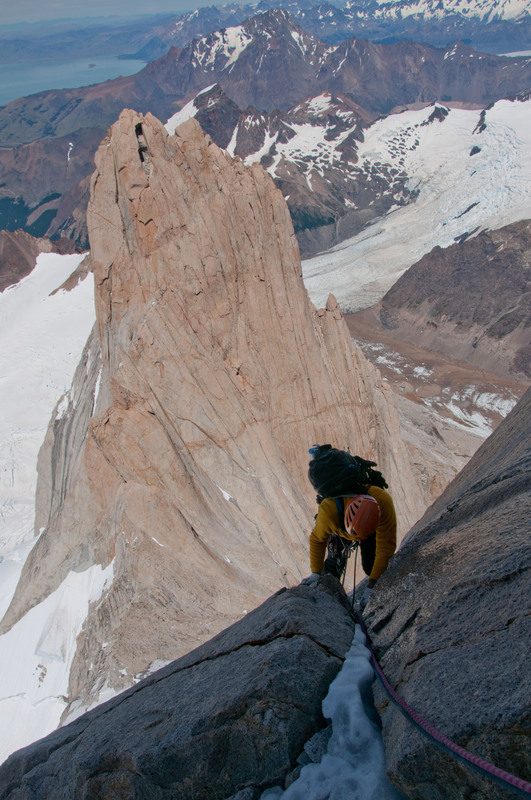 Among them: the Exocet route, a goulotte line to the rear of a chimney drawing a straight line on the south-east face of Cerro Standhardt, and the Ragni route, a long ice, mixed and rime climb going up the north face of Cerro Torre. In the Ragni route the relatively dry austral winter had prevented the formation of rime (icy snow sticking to the ice and to the rocks) which usually makes the climbing more difficult (cleaning/digging work and bad protections). The Exocet and Ragni routes are graded ED and ED+ respectively but this year favourable conditions probably lowered the Ragni route grade to TD+/ED explaining why such a large number of parties attempted and completed the route. 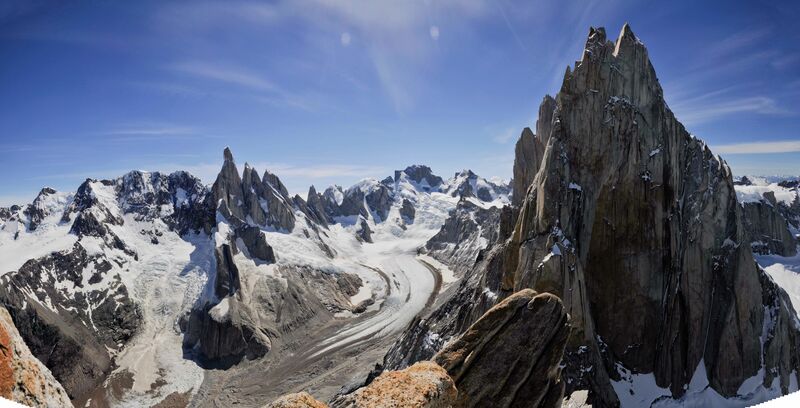 Both routes lead to the summit of two of the most impressive peaks of the massif and have become emblematic due to their difficulty, engagement, itinerary and quality and variety of the climbing. However we did not attempt any of these routes… We had first-hand information on the routes available from Paul, Chris and John, three Canadian guys staying like us at “Refugio Chaltén”, we had all the necessary gear and we had it stashed at the Niponino camp that is the starting point for both routes. We talked over it a lot, weighing the pros and cons and made our decision for two main reasons: first we are fond of the principle of linear progression that we have always applied with Stephan. 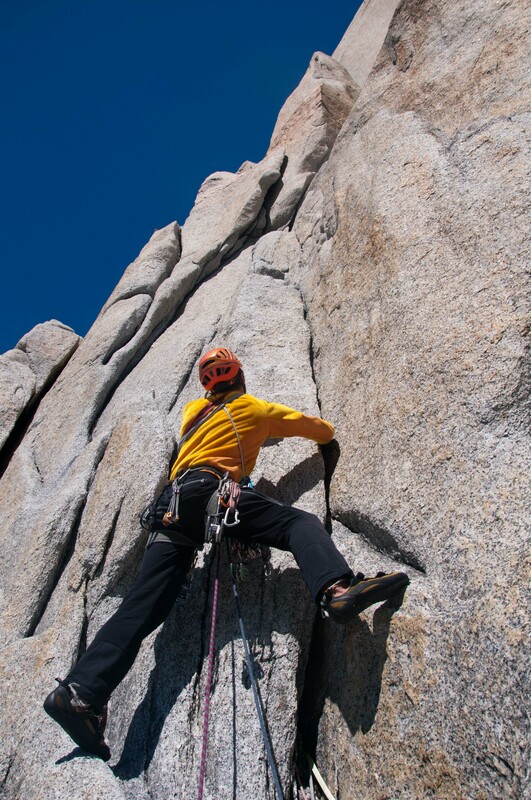 Before attempting an ED route you should have climbed enough TD routes of the same climbing style and even more so in a massif where the engagement is higher due to slow and limited rescue (no rescue in the wall). It was not our case since we had climbed only few TD ice/mixed routes. 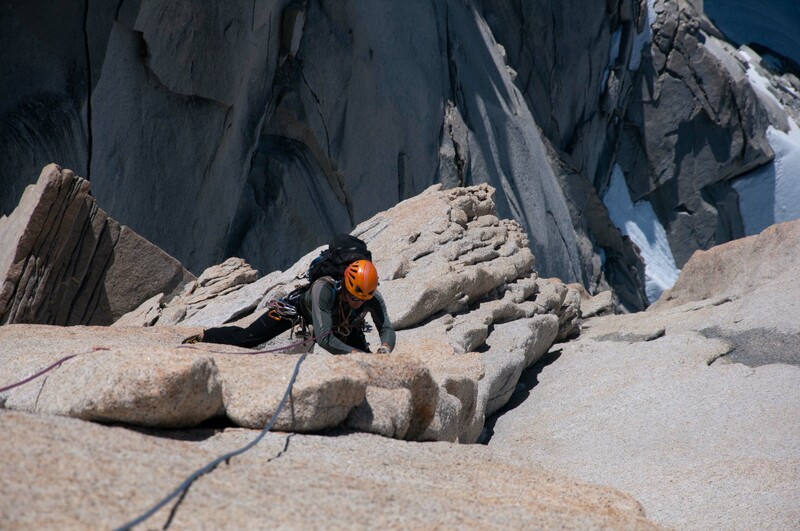 Second we had other worthwhile objectives (although less major…) which were also in good conditions at that time such as the Chiaro de Luna route on Aguja St-Exupéry and the Afanassief or Franco-Argentinean routes on Cerro Fitz Roy. 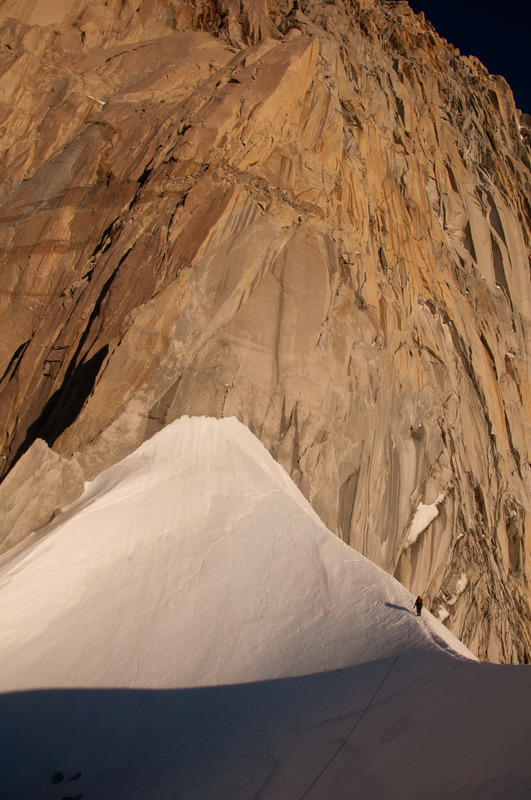 A third reason that concerned only the Exocet route was that only one party can climb the route at a time because of the risk of ice fall in the chimney, raising the probability of retreat during the approach. 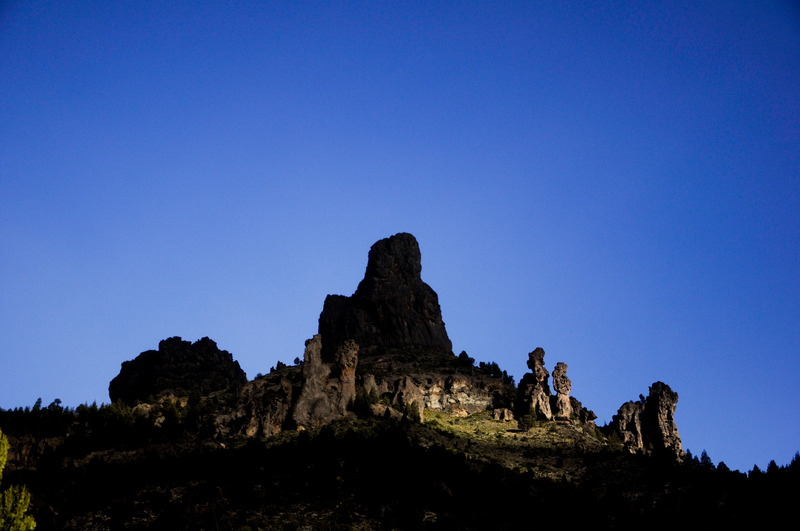 When on Thursday morning, after our climbs on El Mocho on Sunday and on Aguja St-Exupéry on Wednesday, we heard that the weather would hold until Monday evening, we did not hesitate too long. We hiked down to Niponino over the chaotic and unstable scree slopes, packed all our equipment and departed for El Chaltén. On the way we ran across several climbers who we asked for information about the routes on Fitz Roy. 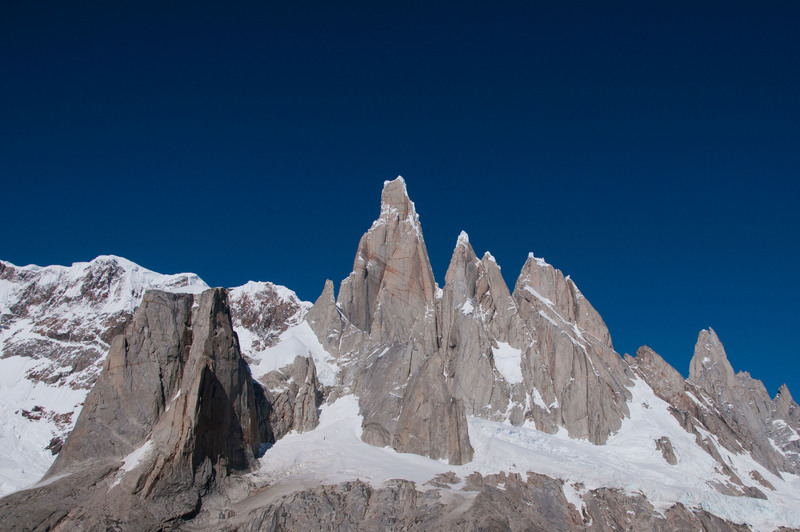 Before the mid-January “brecha” (the present one), Fitz Roy had only been climbed over the Supercanaleta route by a couple of teams during the New Year “brecha” and by one French team over the Franco-Argentinean route in winter conditions beginning of December. 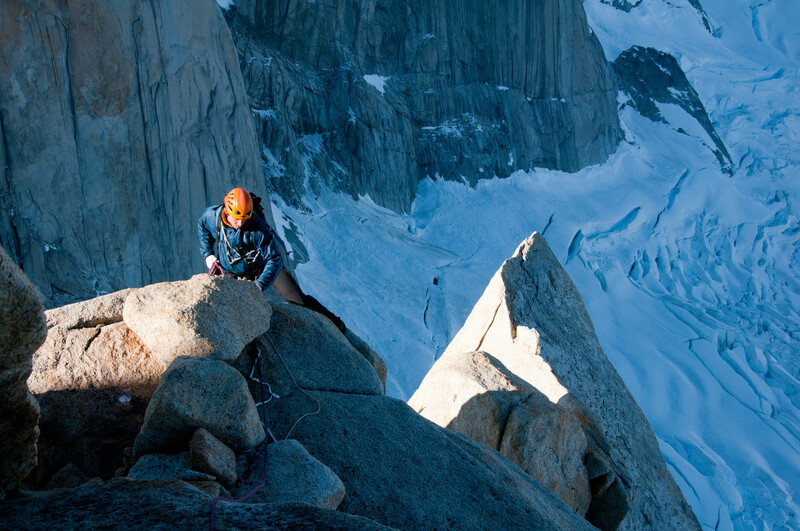 Once in El Chaltén and after having asked more climbers it turned out that only the long Afanassief route and some other long routes on the Goretta pilar had been climbed successfully during the present “brecha” (long means two bivies in the route). 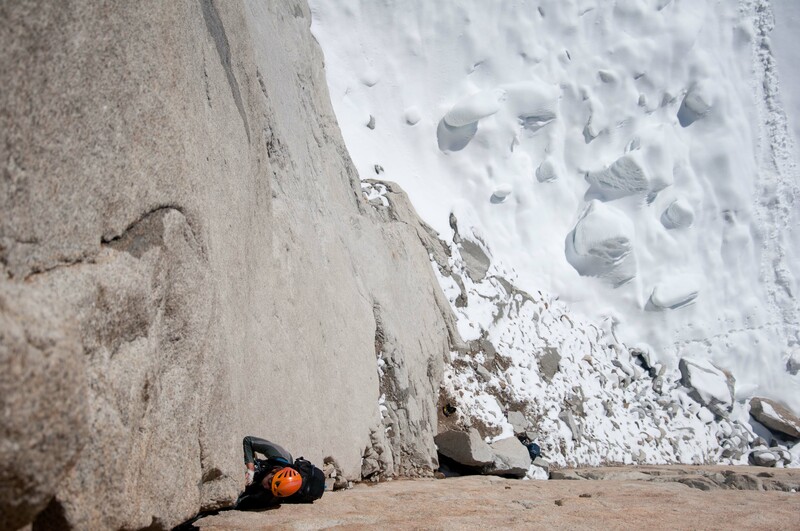 The Franco-Argentinean route had been attempted in the beginning of the “brecha” (on Sunday) but the party had retreated three pitches below the end of the rock climbing part because of large amounts of ice. The long routes were out of question since the time left until the end of the “brecha” was too short (Friday to Monday) and since we did not have the optimal equipment for these long routes. 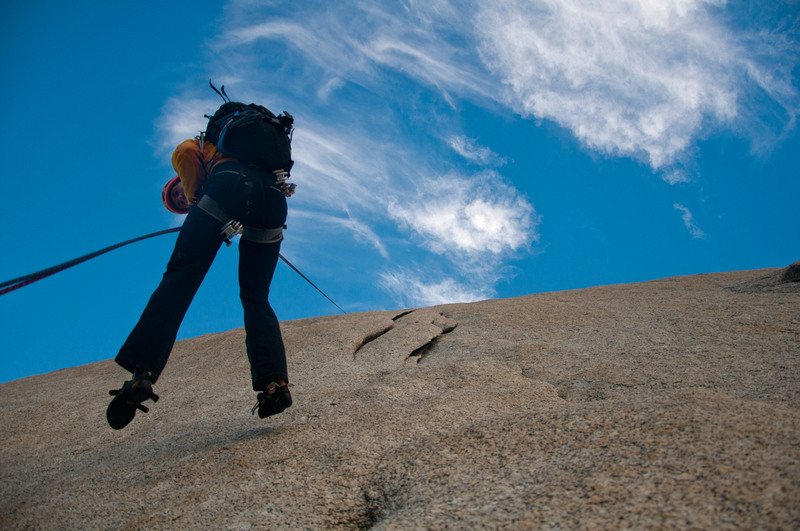 If the second does not intend to jumar it is indeed recommended to have very light backpacks i.e. 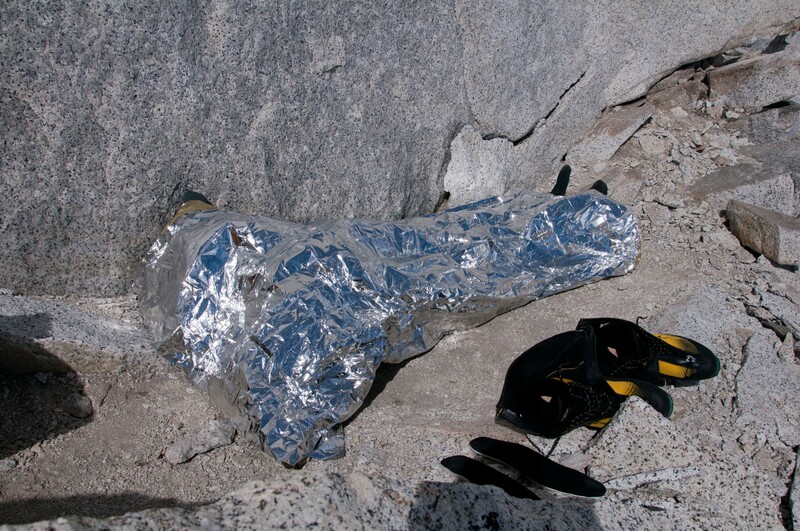 approach shoes, aluminium crampons and a light two-persons sleeping bag. 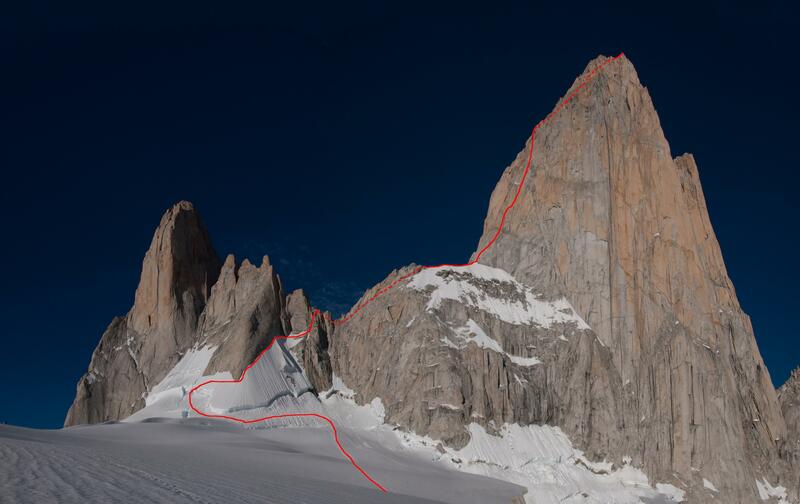 We thus opted for the Franco-Argentinean route hoping that the ice in the upper pitches had melted enough during the 5 days of good weather which had followed the last attempt. We also knew that at least one other party was attempting or would attempt the route that day or the next day. The plan was the following: leave El Chaltén on Friday late in the afternoon, hike to the Rio Blanco camp (three hours), bivy there, start at 5 am on Saturday from Rio Blanco to Paso Superior (four hours) in order to benefit from the night refrost on the glacier (there was eventually no refrost), take some rest during the day until the departure at night on Sunday, summit on Sunday and return to El Chaltén on Monday. We did not take any tent with us to be as light as possible. 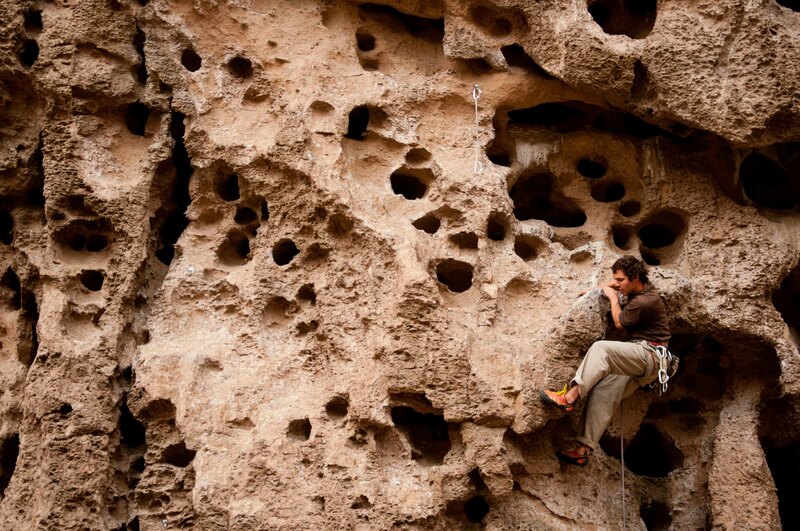 Trying to sleep at Paso Superior. Does this work to keep the heat outside as well? On Saturday morning we were at Paso Superior where we met two of the three parties that had attempted the route on Friday (and first ones since the party on the previous Sunday). 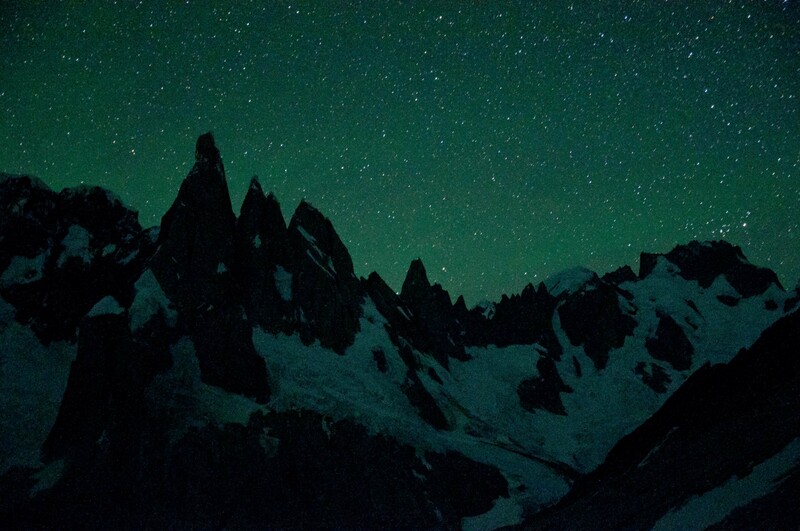 One Austrian party had reached the summit, climbing the last three pitches with crampons and ice axes and being back late on the same day at Paso Superior. The second party, an American one, had turned back halfway up and the third party, also American, was still on the mountain (they had bivied close to the summit). Later that day, Tim and Sam, a Belgian party showed up at Paso Superior also intending to climb the Franco-Argentinean route on Sunday. We woke up at 11.30 pm and left Paso Superior at 0.30 am on Sunday followed by the Belgian party. The refrost was only superficial and stepping aside tracks meant breaking through a delightful crust. We traversed the slopes below the bergschrund to the left until we could spot the tracks of the Friday parties. We found two sets of tracks crossing the bergschrund over snow bridges that no longer existed. 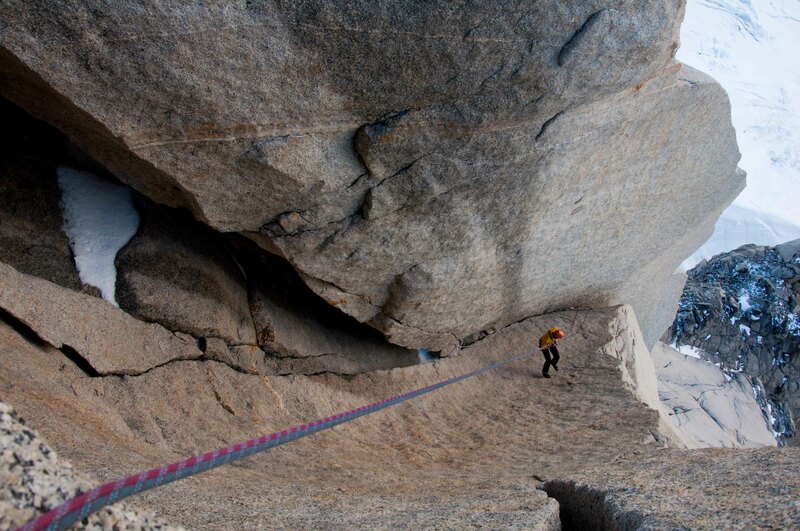 The bergschrund was 5 to 10 m high (double as high if you would have rappelled in it to climb it) and overhanging. We traversed further to the left and almost as far as Aguja Poincenot we encountered a zone where the bergschrund had partly collapsed. A small berm was overlooked by 4 m of steep ice and 3 m of overhanging snow/ice mixture. Stephan engaged in the dodgy section, digging through the snow/ice upper part, desperately looking for good anchor points for his ice axes and trying to make the mantle less steep until he suddenly fell backwards and landed on the berm 5 m below, luckily without getting hurt. He left his backpack on the berm, took the one “estaca” we had and courageously went back to the fight. Some minutes later he had overcome the bergschrund and was hauling his backpack. I joined him and we made a long traverse to the right on 60 degrees steep snow slopes. 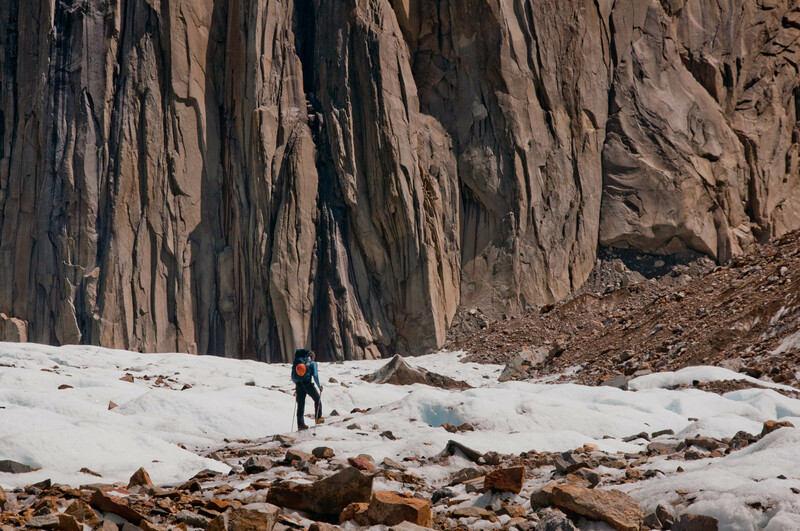 We linked up with the tracks of the Friday parties and followed the base of a rockwall, stepping over ice and bad snow. 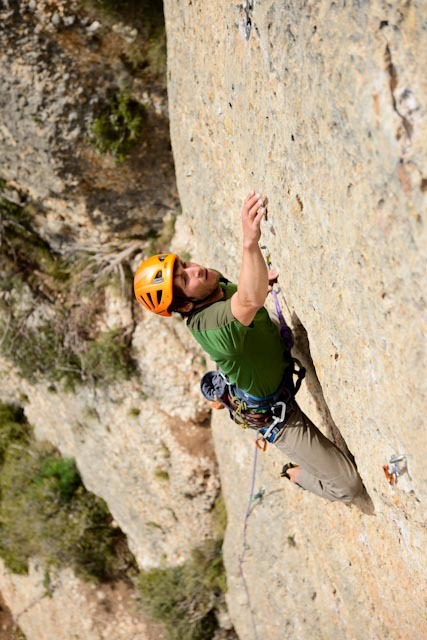 We eventually came up against some rocks and climbed two pitches up to the ridge overlooking the Brecha de los Italianos. We scrambled down to the breach and took a break waiting for the sun to rise. It was 5.30 am. We had a soup and we stashed the sleeping bag, the mattress, the radio, the cooker, some food and two ice axes (out of four). 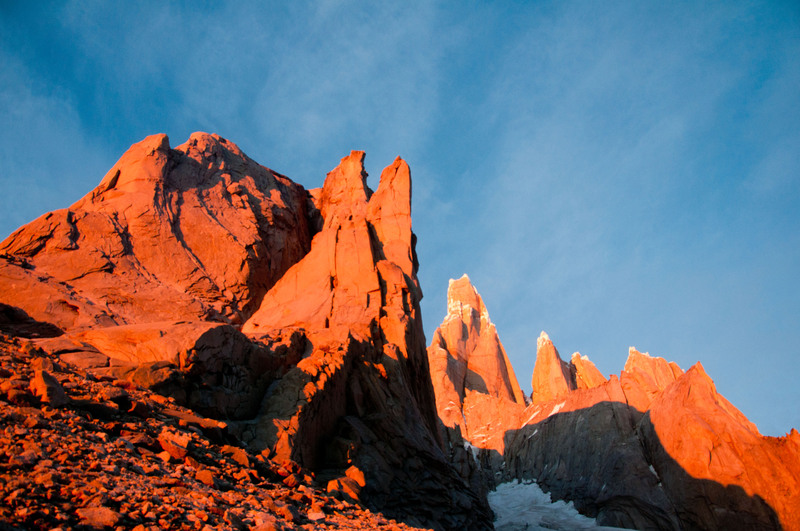 With the first sunlight we climbed easy rocks up to la Silla, the snow saddle at the base of the south-east face of Fitz Roy where the Franco-Argentinean route starts. 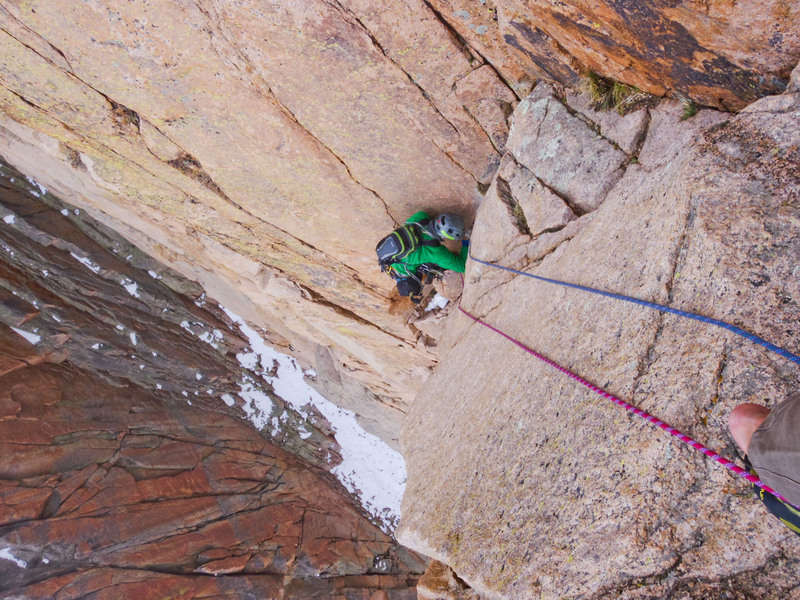 We climbed the first ten pitches (of which some beautiful continuous crack pitches) relatively fast despite many wet sections and our heavy backpacks. The leader carried his mountain boots and his clothes while the second carried his boots and his clothes plus two pairs of crampons, two ice axes, food and water. The 6th grade pitches were sustained but not undergraded as on Aguja Media Luna or El Mocho. On the contrary the 5th grade pitches often included a 6th grade section. 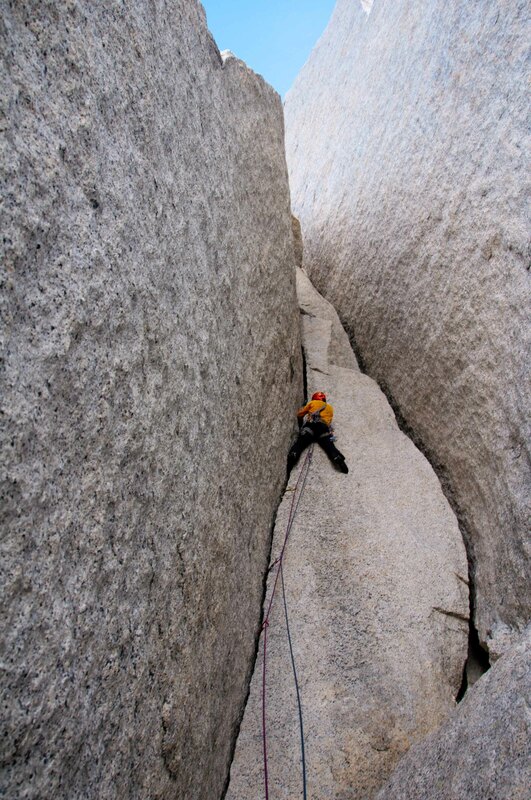 On the last 3 pitches, the cracks are filled with ice, the slabs are dripping and we protect with ice screws, funny! From pitch 11, many cracks were filled with ice and water was flowing on top of it. We climbed the two first 5th grade pitches at the expense of some gymnastics, wet clothes, cold hands (we were in the shade by then) and one ice screw! We then had the choice between a 6c pitch on the left that had turned into a waterfall and a 5+ pitch on the right that was sprayed with large amounts of melting ice. Stephan opted for a variant in the middle. He gained some height removing ice from cracks and holds with his ice axe, overcame a difficult dihedral with the back on one side and the feet on the other and eventually topped out on snow slopes marking the end of the difficulties. The Belgian party had caught up and chose the same option. 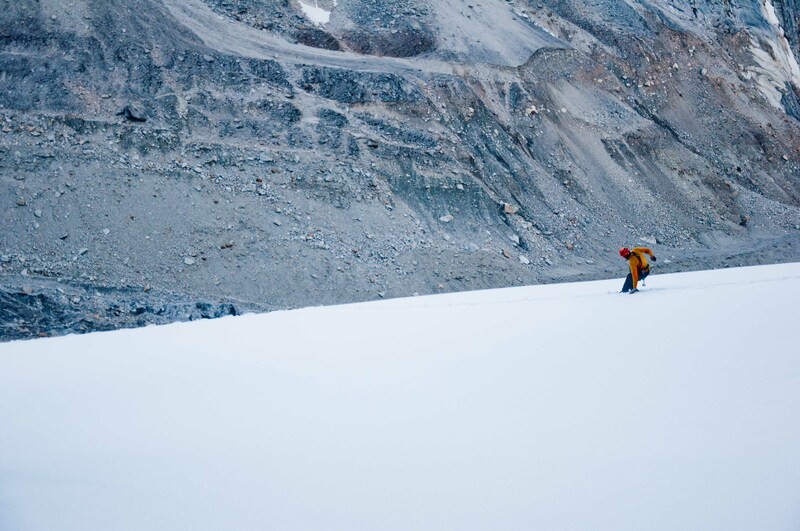 We put on boots and crampons and climbed the last 250 m of 50 degrees steep ice. 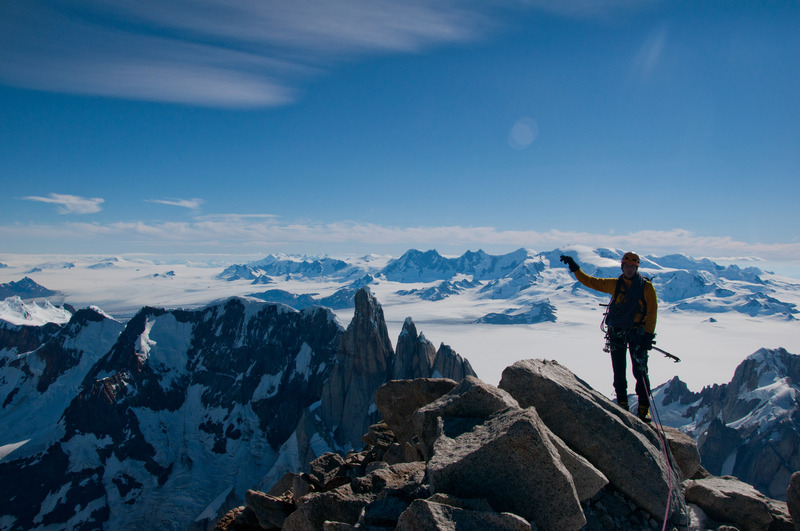 At 6 pm, almost 18 hours after having left Paso Superior, we were standing on the summit of Fitz Roy, warmed up by the sun still high in the sky but shaken and cooled down by high winds while admiring the Campo de Hielo, a huge, flat glacier covered with snow stretching beyond the Torre massif. We started to abseil stucking the rope only once in the upper slopes. At 11 pm, around 20 rappels later, we were at the Brecha de los Italianos. 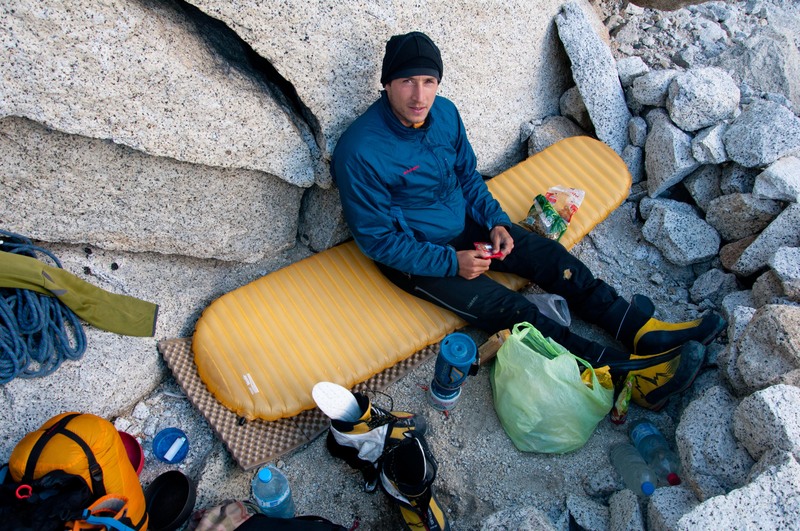 We had a five-course supper (1 cracker = 1 course) and tested the concept of one sleeping bag and one matress for two, sitting instead of lying down because of the lack of space. We experienced the feeling of being so tired that we only thought of sleeping but being prevented from it by the cold and the discomfort of the position. 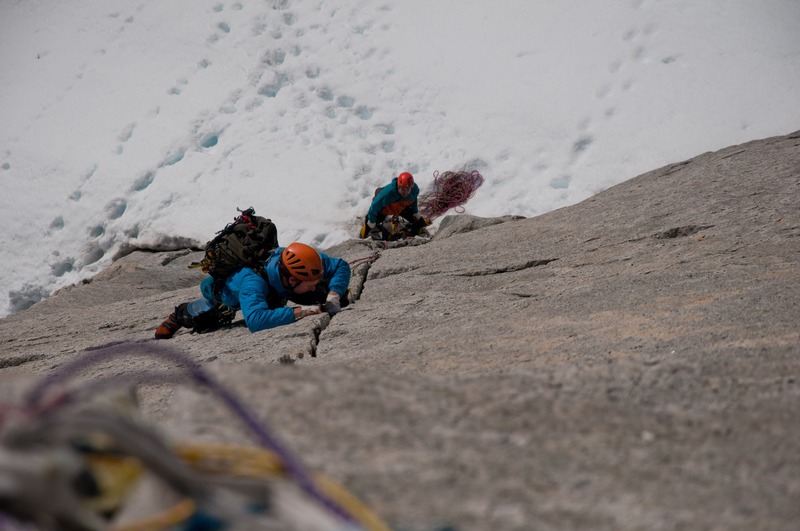 At 4.30 am, tired of not sleeping, we prepared some tea, ate the last crackers and at 5 am we were abseiling the first out of eight rappels from the breach down to the glacier. 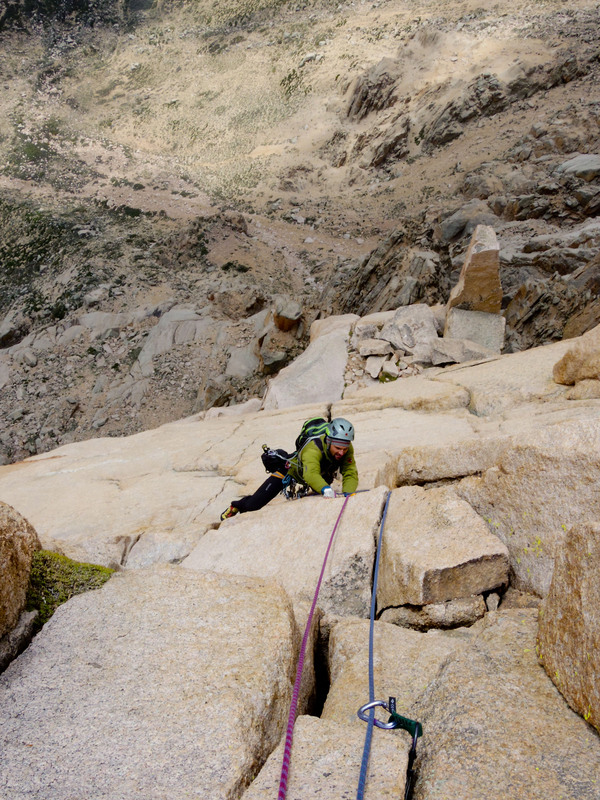 The Belgian party had stuck their rope in the last rappel before la Silla so that they had to spend the night up there and to climb the first pitch again in the morning to unstuck their rope. At 8.30 am on Monday we were back at Paso Superior happy, tired and relieved, 32 hours after having left. We ran down in the midday heat to Lago de los Tres, Rio Blanco and Laguna Capri where we had a swim and ate our last rations of bread, “cremoso” cheese and “dulce de membrillo” (quince). 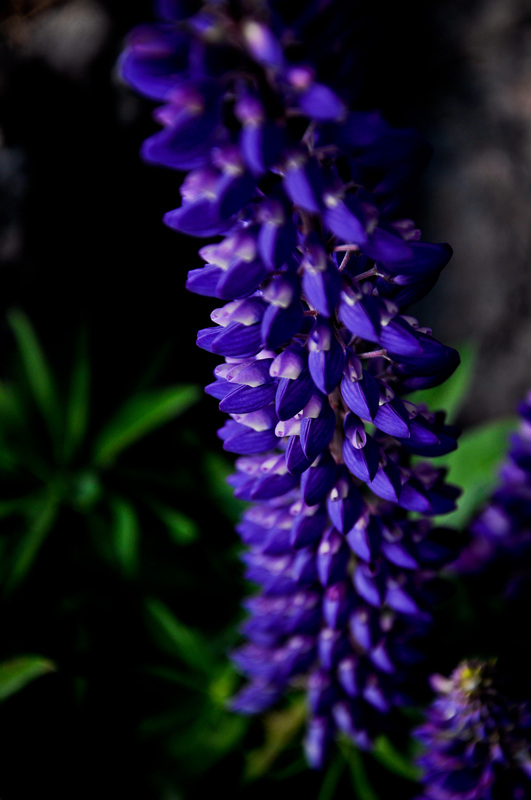 On Tuesday the “brecha” was over and the wind was blowing again through the streets of El Chaltén. Within 2.5 hours, at our hostal, we sold 30 kg of gear (ropes, friends, ice screws, backpack, poles, expresses, tent, clothes) to Argentinean climbers. On Wednesday morning we were leaving our homelike hostal “la Casa de Jesús”, Natalia and the kids with heavy hearts after three and a half weeks in El Chaltén. Soon it would be time to leave South America as well. Stop Shaking the Tent, Please! Living on a separate island forcingly changes one’s way of life. The first concern for sure is food and shelter, once this assured, one starts to look for activities and tries perhaps to connect to the outside world with a message in a bottle. 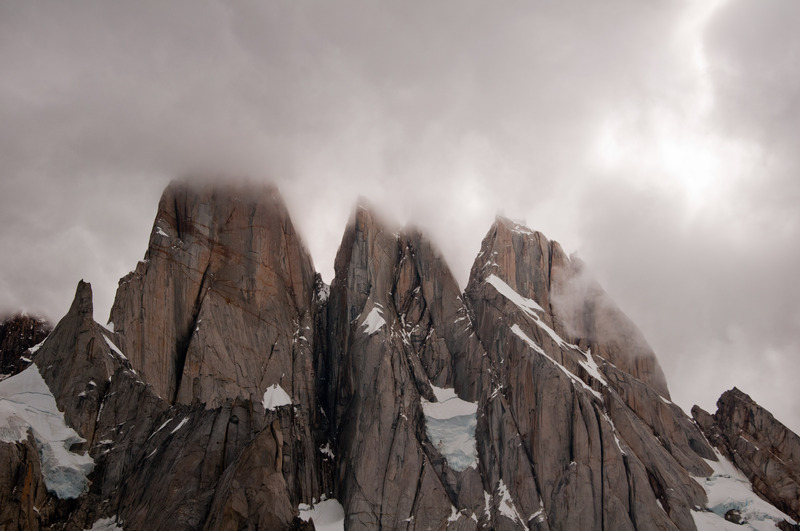 After the first “brecha” in El Chaltén, the weather seemed to be very bad beyond the forecasted time which is 8 days. So we were to experience this very same isolation since we were trapped in El Chaltén, waiting for the next window of good weather. Analogue to the island life (let it be a tropical island to make things easier), our first focus was the kitchen. Our menus improved drastically, Pumpkin “Quiche”, Brownies, home-made bread, Banana cake, Moussaka, Lentil goulash… As for our shelter, in the Refugio de Chaltén, the family of Natalia and Jesús and their kids made us feel at home. 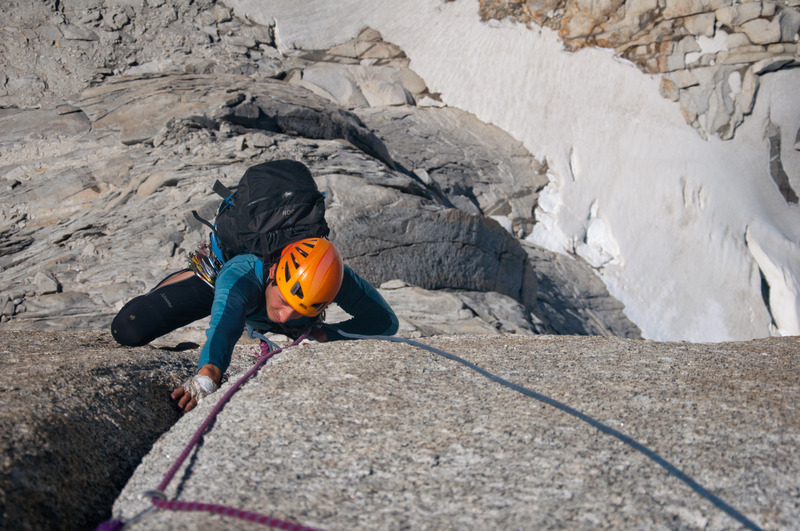 Our daily training consisted in climbing the nearby cracks when the weather was good enough, and some stretching and important thinking when the weather was bad. Every year hundreds of seasonal workers are coming to El Chaltén during the summer to work in hostals, restaurants, ice cream shops, trekking agencies, etc… Most of them are young folks and very active even after their workday. Coming from different parts of the country and with different backgrounds, everyone contributes what they can to animate the life in Chaltén: Folk dance lessons, tango lessons, concerts, milongas, recitals, cinema classes, etc…, much of it taking place in the friendly café La Lucinda. Louis traversing the river, body tension! After all, the ten days we had to wait for the next “brecha” went by quickly with all these activities. The weather finally looked promising, beyond the end of the forecast! Although only the three first days are given with a high certitude, this seemed to be an incredible happening. We set off on the first day of good weather, walking below a clear blue sky. As bad the weather can be in Patagonia, as surprisingly good can it be during the “brechas”. 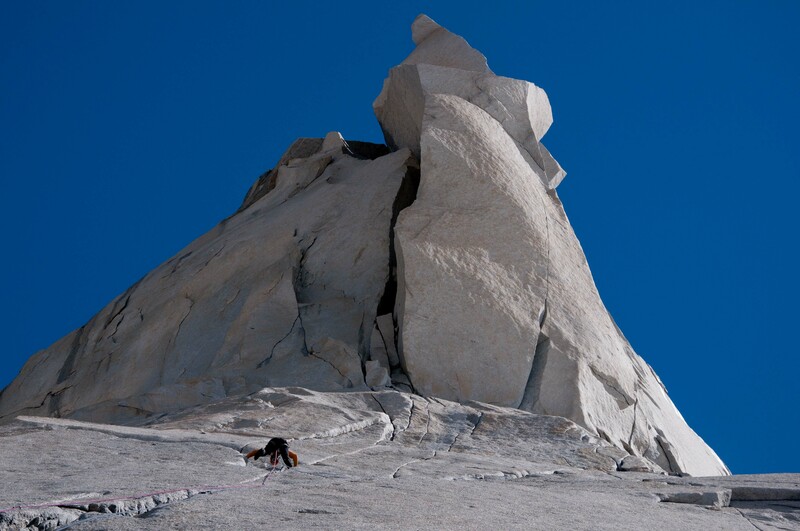 Our main goal was to climb the route “Chiaro the Luna” on the Aguja St-Exupéry, a must do for rock climbers and we wanted it to be dry, since the team that had attempted it during the last “brecha” had had the cracks of the upper pitches filled with ice and therefore had turned around before the summit. 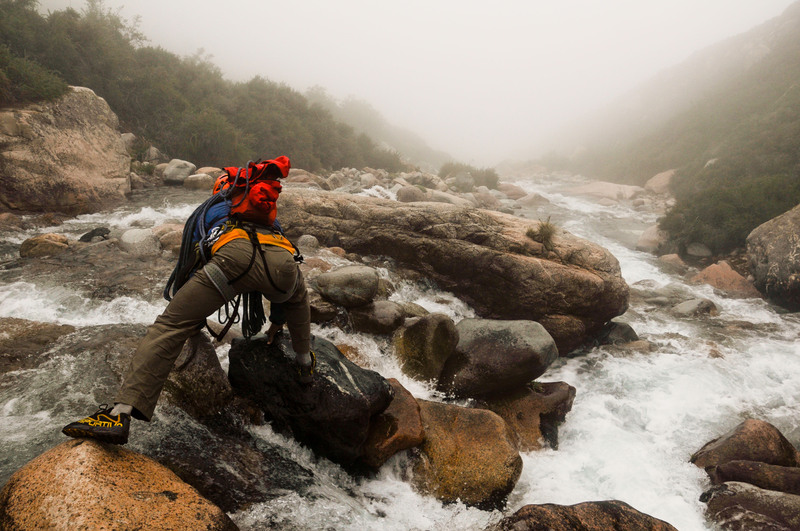 Upon our arrival at the Niponino camp, the face we wanted to climb was drenched in water. 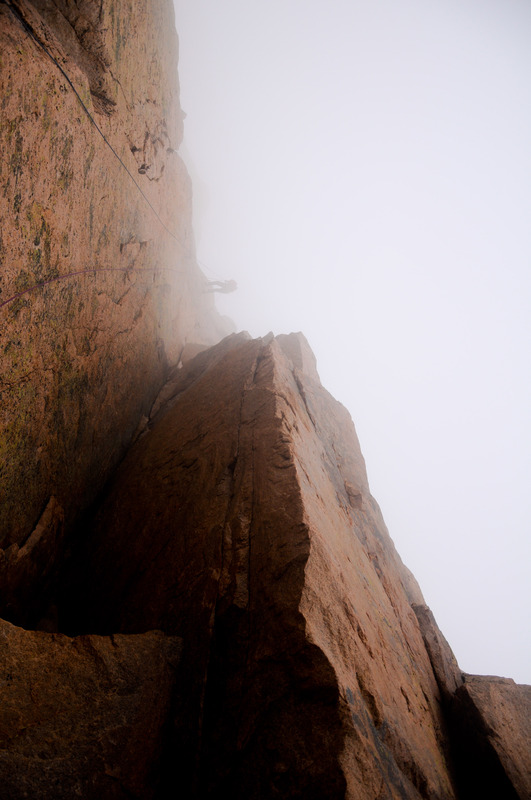 Our planes were soaked as well, so we decided instead to climb first El Mocho, a summit on the Torre massif at a lower altitude which looked dry. That is not over modified! We got up before dawn and climbed to very, but very unstable moraine up to the foot of El Mocho. The sunrise dipped the steep rockwalls in red, just as we reached the start of our route, the “Voie des Bénitiers”, opened by the Swiss Michel Piola. 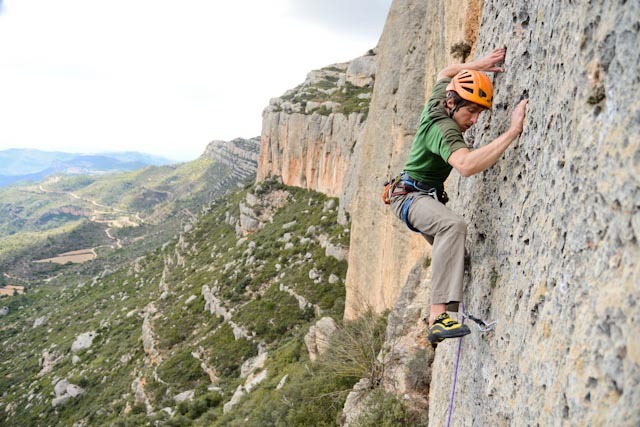 Louis was leading the first part with several tricky 6b pitches, whereof one very memorable pitch climbing a distinctive pilar by a 30m long hand jam crack, incredible! 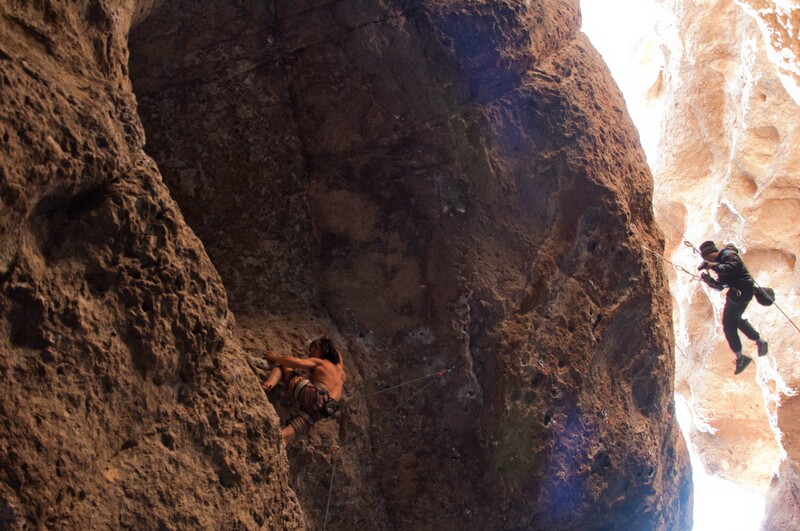 I started to lead the crux pitch, a 40m exhaustingly long finger crack system with a severe move on a slab that goes free at 7b+ (at least that is what they say). 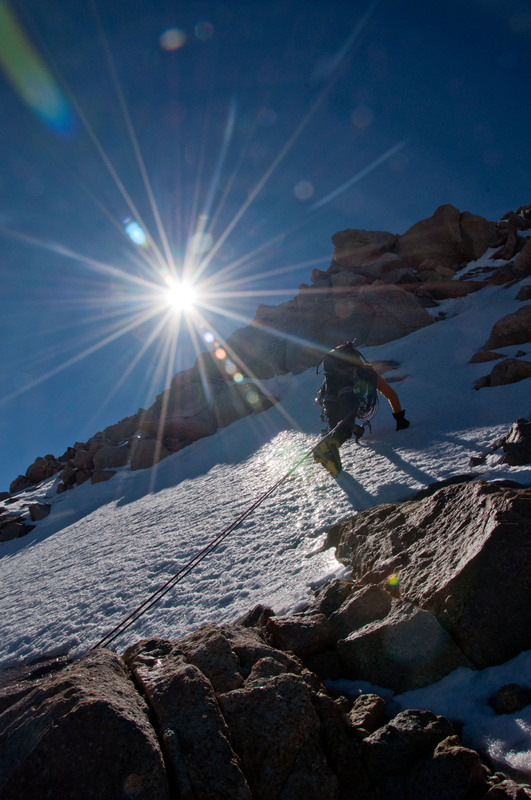 The climb remained sustained until the end, Piola is not known for easy grades… The sun was strong that day, drying us out, so that the snowfield at the top was our salvation. Despite stucking our rope twice, we managed to rappel down quickly and reached our tent before dawn. During the day we could spot at least 3 teams in “Chiaro de Luna”, all the better we had changed our planes avoiding the congestion, and during the night we saw a few head lamps coming down the approach gully, we hoped it would not be our case. The next day was a rest day, we wanted to find out how the weather forecast had evolved and we used our radio to communicate with the National Park guards. The information they provided did not allow us conclude, only until a recently ascended hiking guide informed us about the actual conditions. We knew that we had to make a second rest day because of high winds and a bit of rain, which occured pretty exactly. On our second rest day we tried to kill time socialising. We met two teams that had made attempts on the South East Ridge of Cerro Torre (Corkscrew Linkup and Kennedy-Kruk route), interesting persons with very interesting projects. We started hiking in the afternoon to join a small bivouac place at the foot of the Aguja St-Exupéry in order to shorten the hike to our next route. Equipped only with a sleeping bag and a mattress, we passed a splendid first night under the stars, with a direct view of the Torre massif. 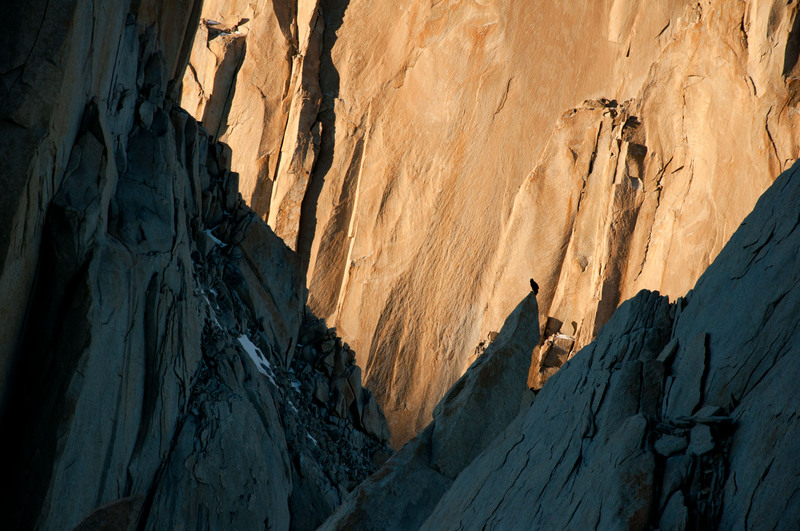 We got up early in order to start climbing with the first light. 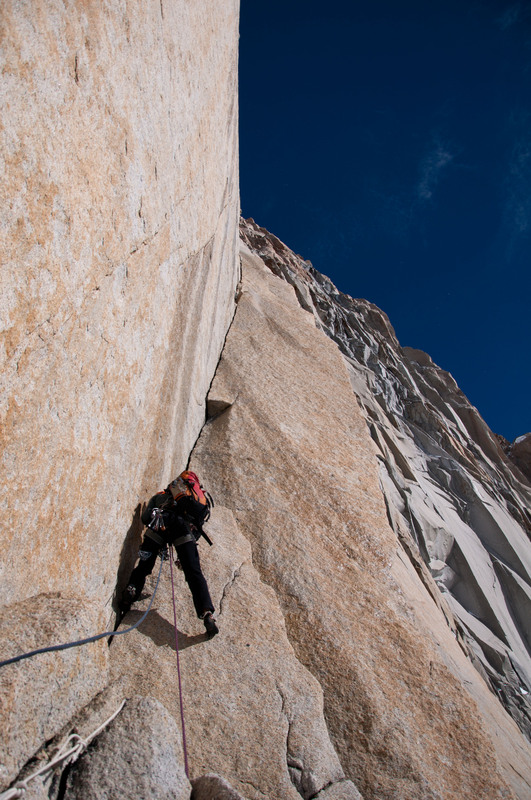 The air was fresh and the sun was not supposed to shine on the route before midday, but we soon got the rythm of the cracks, which were to be never ending and perfectly shaped. 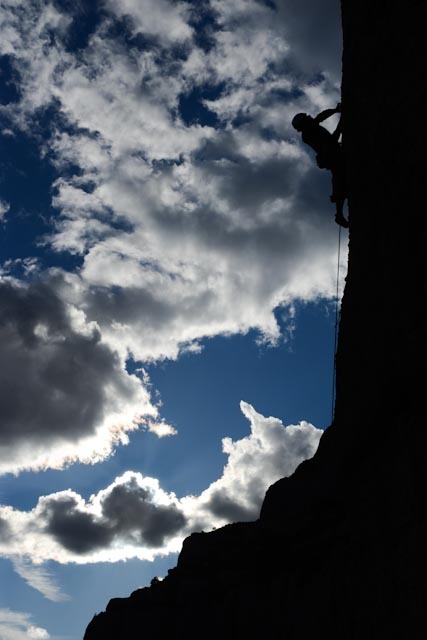 Being the winner of our highly sophisticated selection method, Louis led confidently the first half of the climb until we reached the shoulder where we changed the roles. 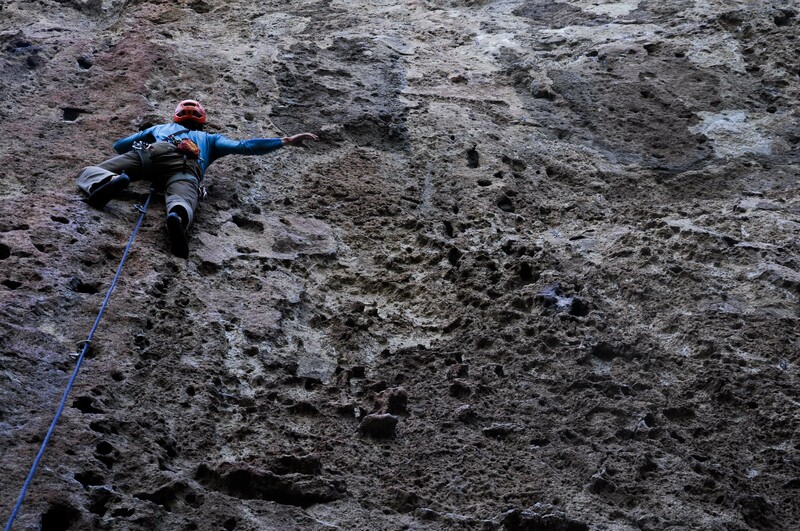 After some improvised route finding, we arrived at the crux pitch, which was an amazing 50m pitch with some steep climbing and a 10m Dülfer runout at the end – better not think about it too long but climb. A few more pitches in a deep and wet chimney led us finally to the summit ridge which was already in the shade and covered with ice and snow. 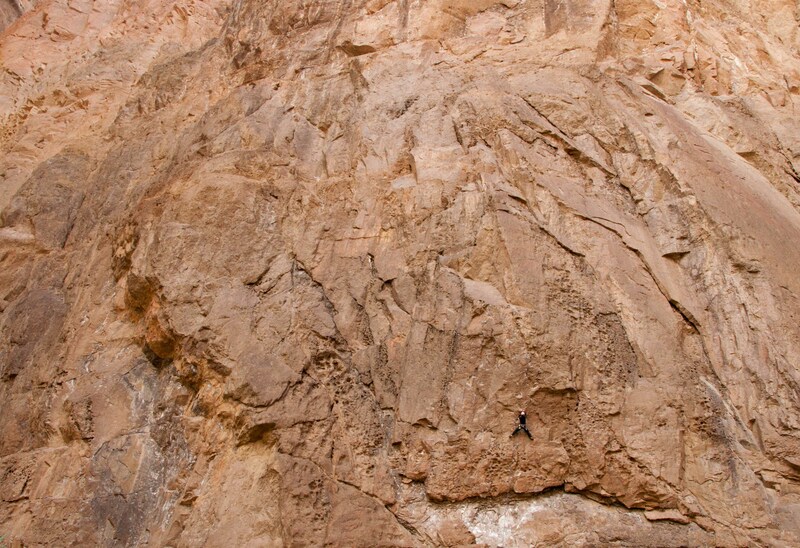 10 m of unprotectable dülfer… don’t think, climb! At the summit we met the South African team which we had got to know the day before, who had climbed the Kearney-Harrington route. 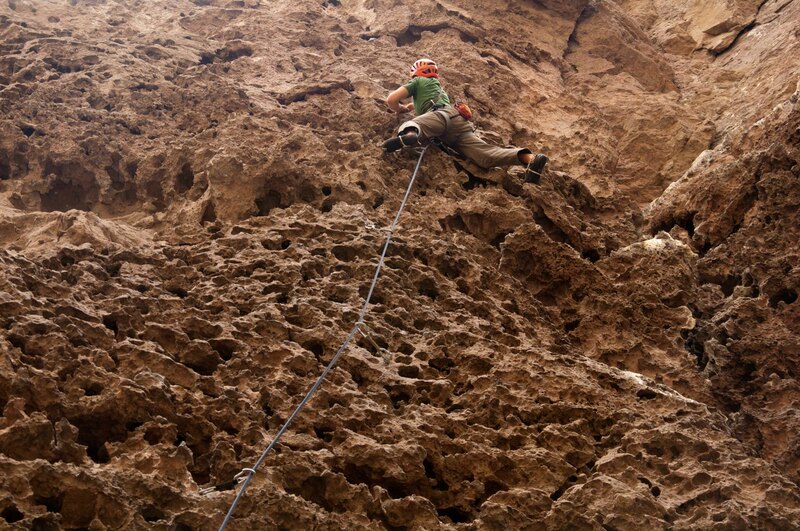 The summit was really nice, but we were only halfway since the rappels promised to be interesting. 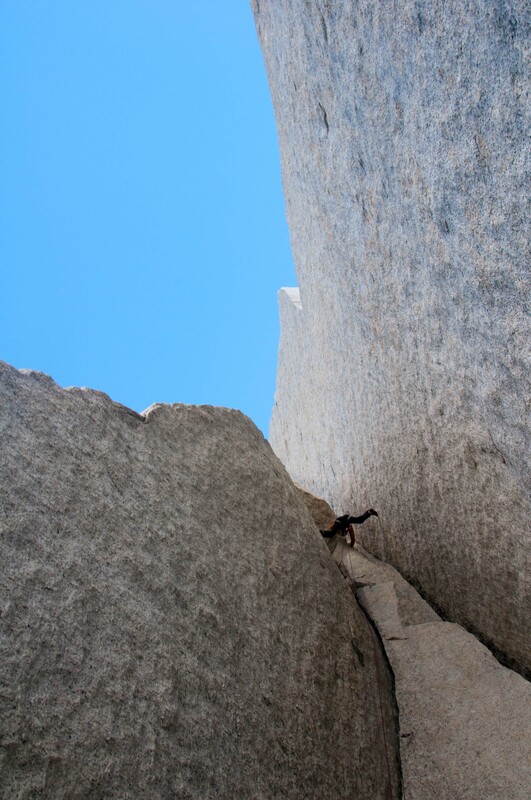 Instead of following the South African team, we decided to descend the chimney that we had climbed up, according to the topo… Due to the disrupted character of this chimney we were forced to make short rappels in order not to block the rope which took us an eternity. Soon we saw the other team descending the gully at the bottom of the rappels and we still had a couple of rappels to go. Finally at the break of the night we reached the gully. But the game was not over yet. Since we are supporters of the “light and fast” technique, we had left our boots at the start of the climb which was a good 250 m below us on a 45 degree slope with quite a lot of loose stones, snow and slabs. Furthermore a huge rockfall had taken place during the day in this very gully, shaking our mountain and covering the slabs with a layer of dust and rock debris thick enough to make us slip with every step. 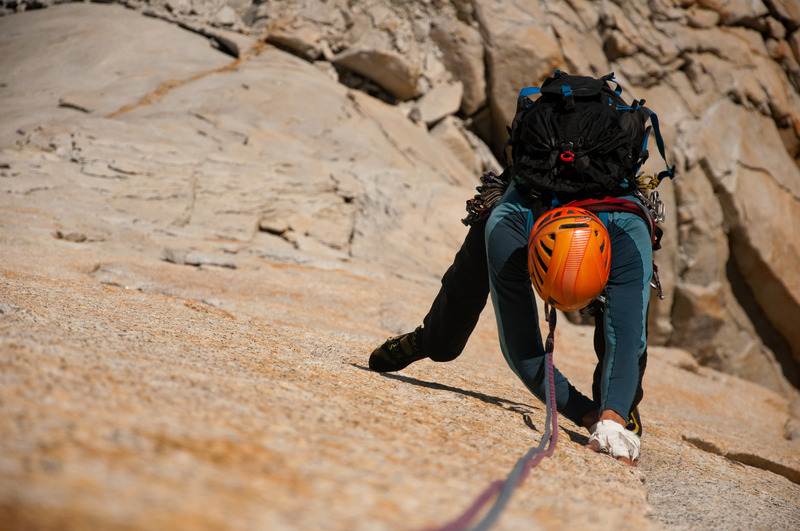 Soon we realised that walking down with the climbing shoes was not an option, so we started to rappel down again, fighting with the knots in our rope, the search for belays and the loose rock debris. The darkness was complete during the new moon, so we wondered how the h… they could have named this route “Chiaro de Luna”?! Finally we reached our bivy spot and spent another night below the stars. 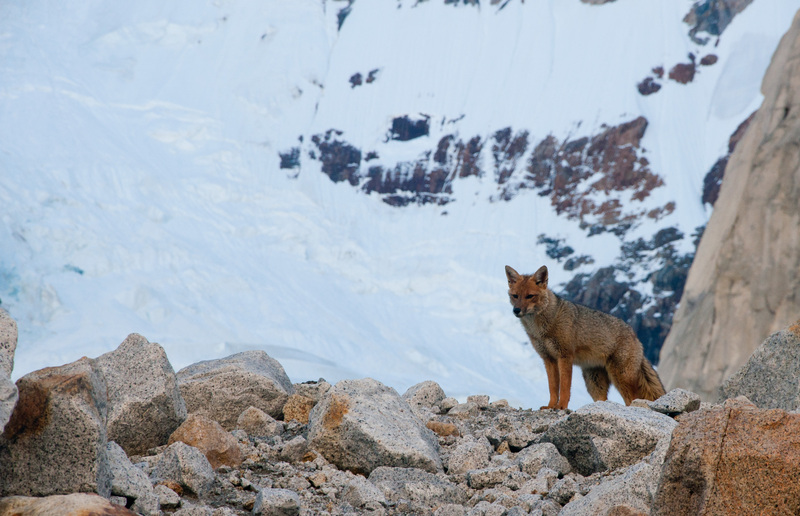 The next day we descended to Niponino, only to discover that the fox had broken the protective rock barrier around our food stash and had eaten or tasted most of it. With the news that the weather was still favourable for at least four more days, our decision was therefore taken easily: hike down to El Chaltén, buy more food and attack again! 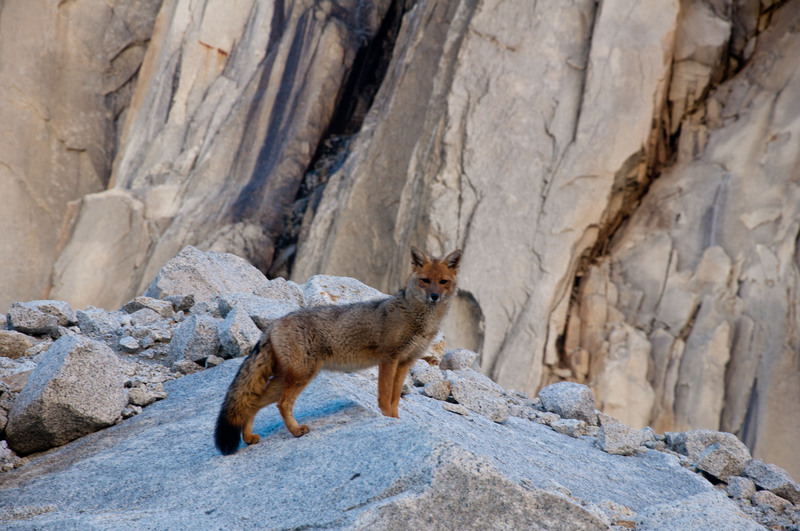 The fox is observing. 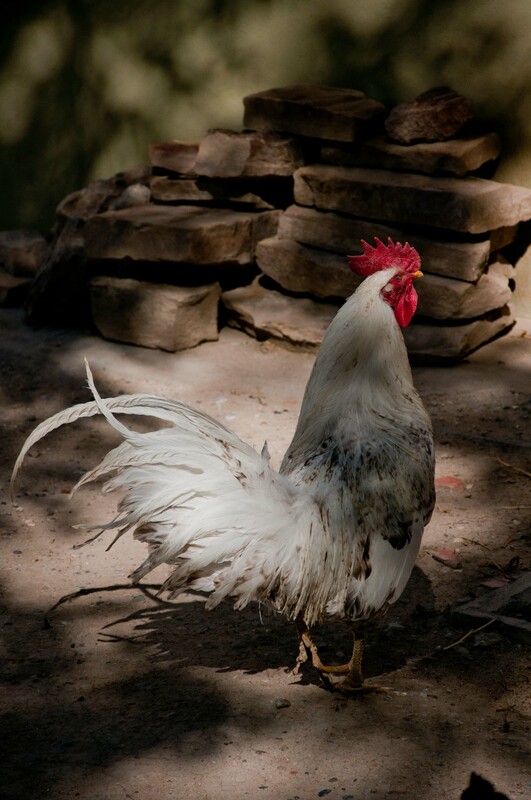 During our last night he succeeded to move away really heavy stones and stole most of our food… What a b…! We knew little about El Chaltén before getting there except that it is a small touristic town at the foothill of Cerro Fitz Roy and that it would be the starting point of our climbs on the nearby granit spires. 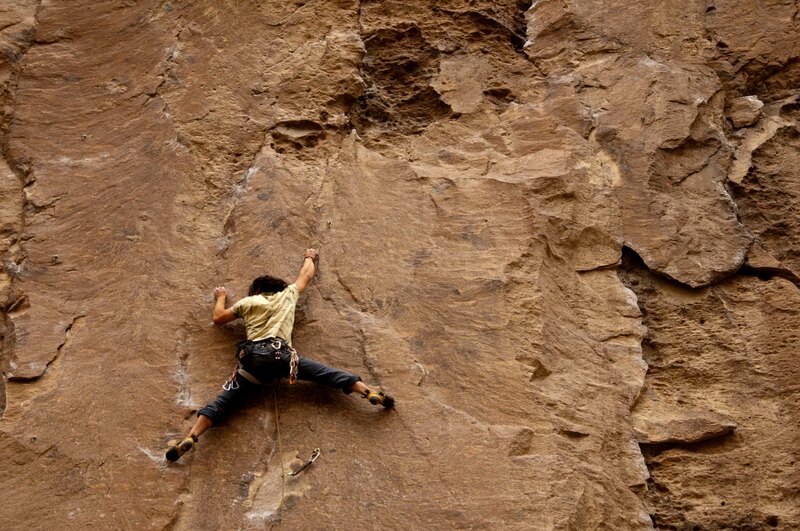 Some months ago in Huanchaco (Peru) during our surfing break we had watched a climbing movie taking place in El Chaltén. 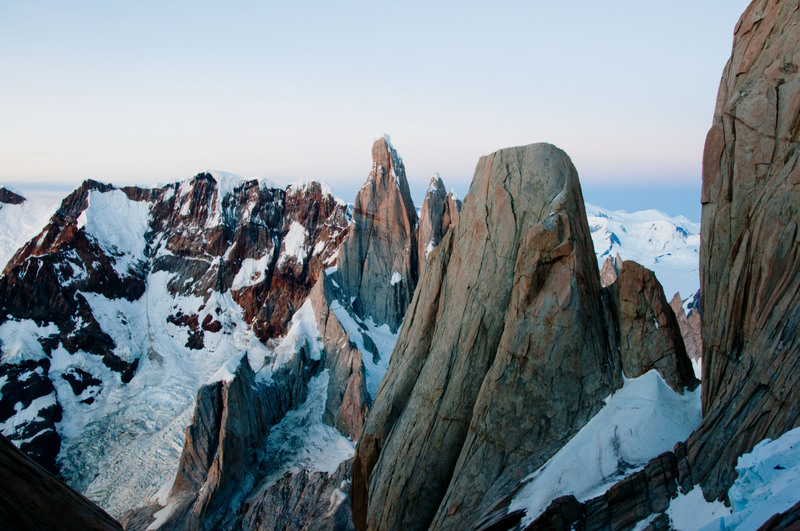 An American climber accompanied by two friends honoured the memory of his deceased girlfriend by opening a new route in the Fitz Roy range. 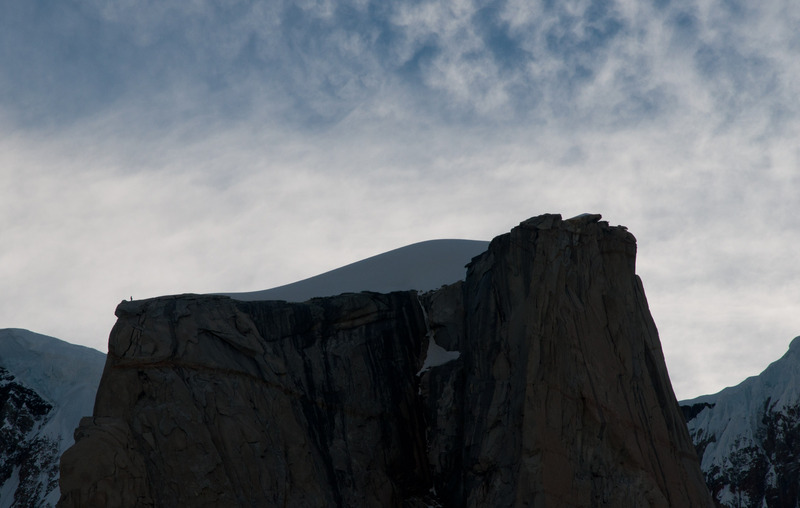 Their plans were thwarted by persisting bad weather until they could realize a first ascent in the very last days of their trip. Some sequences of the movie endeavored to show the town and the climbers trapped by the storm: rain drops splashing against the windows of small, neat, wooden houses standing bravely in the high wind. My mind had shaped a picture of El Chaltén similar to the one of Hogsmeade, the small town next Harry Potter’s wizardry school (it is funny how imagination works…). Low houses overwhelmed by succeeding cold fronts or by the spirit of Voldemort and painted with bright colours as an act of defiance against the harsh climate or against dark magic. Grocery, bakery, coffee shop, hostal lined up along the main street and proposing services and goods to the visitor at the same time as they provide him with a temporary shelter. Our arrival in El Chaltén from Esquel along “Ruta 40” meant the expiry of my mental projection and its replacement with a more positive one. The rapid development of the town in the last years under the pressure of the tourists flow took place in a quite spontaneous way. Its grid pattern of streets stretches out in all directions and the transition from pavement to gravel indicates the distance to the center. The mixed construction styles are only dictated by the taste and the often modest resources of the owners. As a result El Chaltén reminds of any functional town in remote areas of Canada or Scandinavia. The 100 m high cliffs surrounding the town in the south-east could even mislead the uninformed visitor by making him think that he finds himself in a rock quarry. 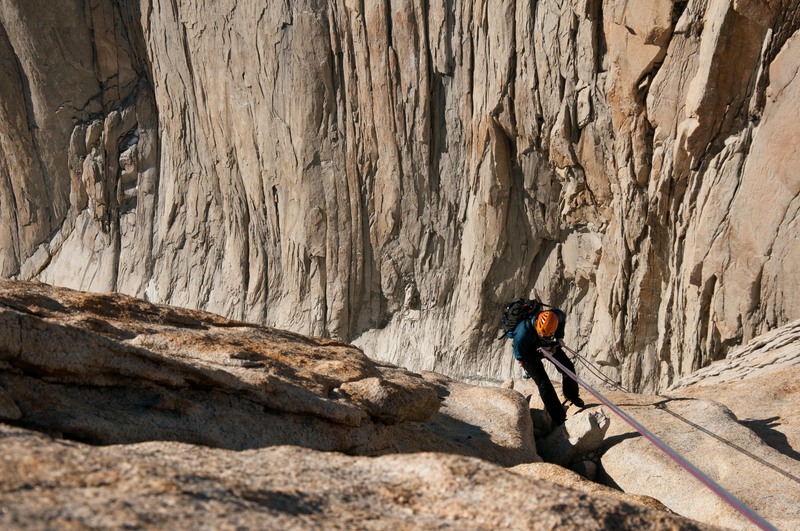 Ten years ago El Chaltén was confined to one camping and one grocery. 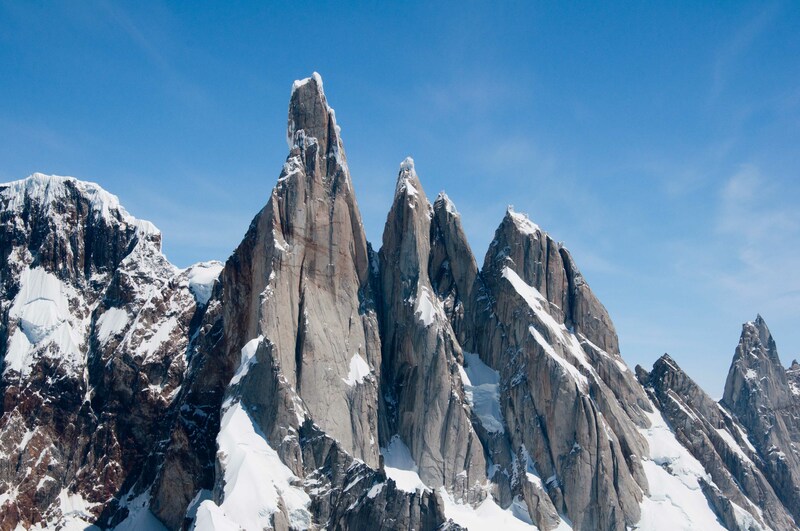 Climbers did not stay in town between two “brechas” (or good weather windows) but used to camp closer to the peaks at places like D’Agostini, Rio Blanco or Rio Eléctrico about two hours away from El Chaltén. Nowadays El Chaltén counts dozens of hostals, restaurants and shops. Phone and internet connections are available (satellite connections though, slow and dependent on weather and winds) and all climbers return to town after a “brecha”. Aguja St-Exupéry, Aguja Poincenot, Cerro Fitz Roy and diffraction pattern?! 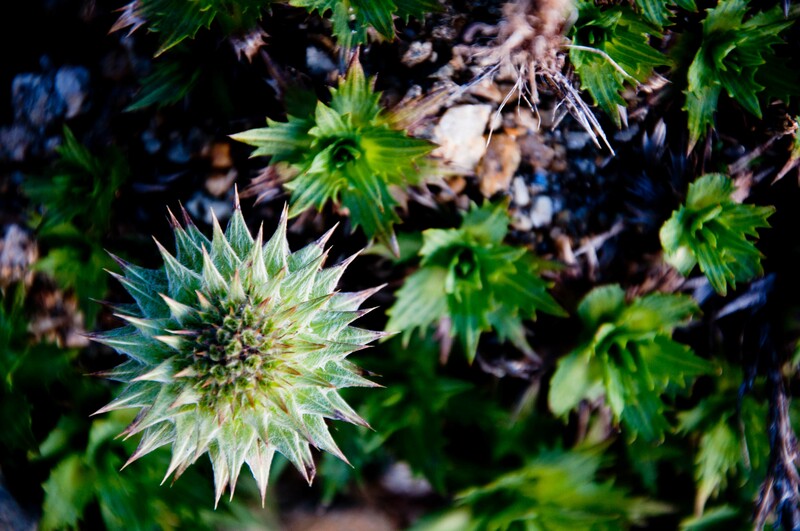 In the winter El Chaltén leaps ten years into the past. It is deserted by most of its inhabitants/seasonal workers (the population not including tourists reduces from 5’000 to less than 500) and the economic activity of the town stops except for some construction work. 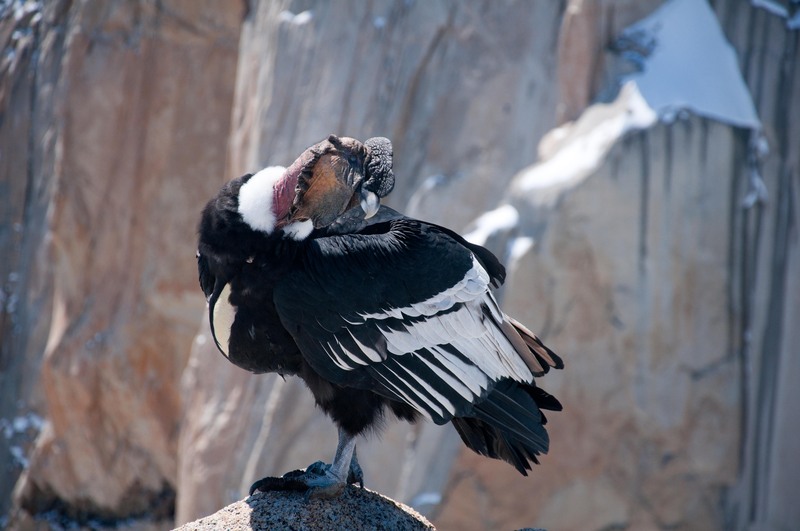 First inhabitants came from the region around El Calafate 200 km away (which has also experienced an important development in the last years because of tourism). In the mid 90’s, during the economical crisis that struck Argentina, many people facing unemployement moved to touristic regions offering better job opportunities from all over the country . On our first day in El Chaltén we raced around town to get information about accomodation (the hostal booked in advance per internet was crap), weather forecasting, route conditions and topos. 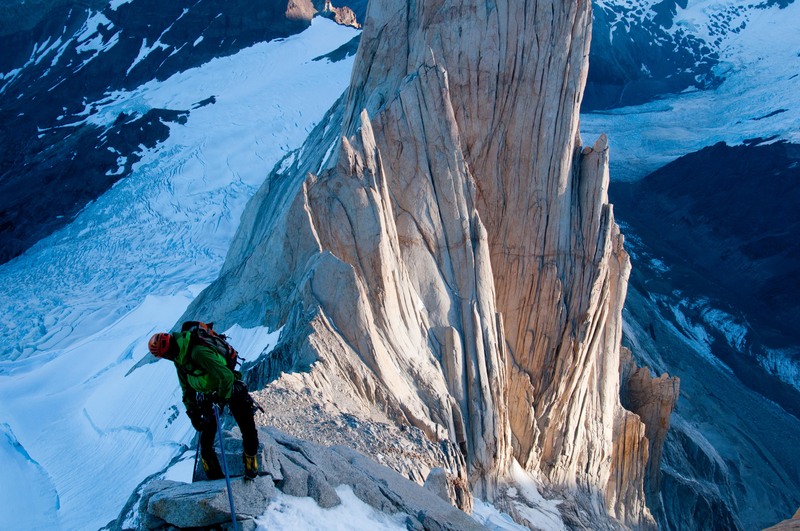 We got a copy of the sport climbing topo for El Chaltén at Kalen restaurant. It is also Maria, its young boss and best cook in town, who gave us the adress of Refugio Chaltén or “La casa de Jesús”, the fantastic hostal where we would stay during our time in town. In the late afternoon, on the advice of a climber met in the street we ended up at Aires Patagónicos, a restaurant organizing private sales of mountain equipment and having the freshly printed alpine climbing topo by Rolando Garibotti (also founder of the very useful website PATAclimb.com) for consultation. Climbers progressively showed up in the restaurant and we rapidly found out that a two days “brecha” had just come to an end the day before. We learnt pretty much everything what we needed to know thanks to Belgian climbers and Juan, climber and cook at Aires Patagonico: how to generate the correct GFS meteogram, how to recognise a “brecha”, how to access the Niponino base camp, how to watch out for the hungry fox, … Another two days “brecha” was forecasted four days later and we planned to rock climb around Niponino on the not too high Agujas Media Luna or Mocho. It had been snowing a lot in December and there was still much snow in the cracks and ledges of the higher peaks. We also decided to make a roundtrip to Niponino before the “brecha” to scout the path and the rock faces and to carry equipment in advance. The models were forecasting winds up to 10 knots for the next day and up to 13 knots for the day after next. We had been told that no one climbs with 10 knots of wind but we did not think of 10 knots to be an issue to hike. We walked 2.5 hours to Laguna Torre one of the most popular hikes around El Chaltén not noticing much wind thanks to the forests and morains lining the trail. 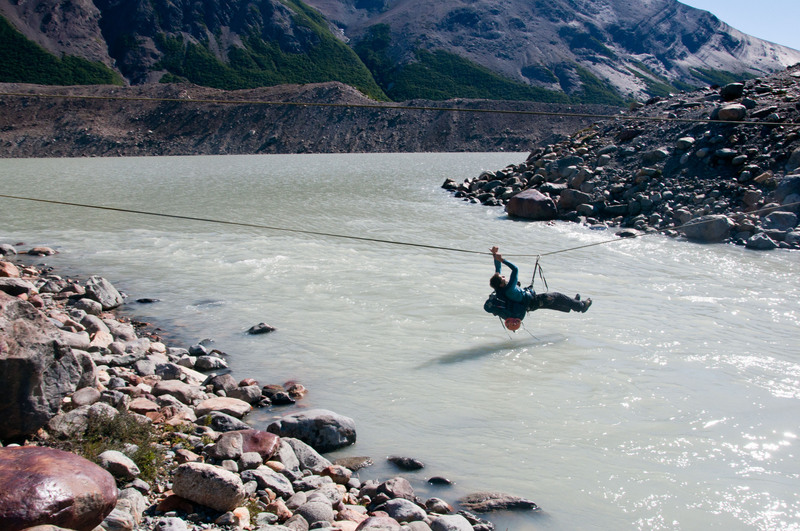 At the lake we put on our harnests to cross the river over the tirolean and skirted the lake heading to the Torre glacier. The wind picked up as we left forested terrain. We lost our way on the descent to the glacier, scrambling down loose morains and thrown off by powerful wind gusts and by our heavy backpacks. Back on the footpath along the glacier the wind was so high that we often stopped and held on to the rocks not to be knocked down. At the time of stepping onto the glacier (still 1.5 hours away from Niponino, El Chaltén-Niponino takes 6 hours), arched over our walking poles, stunned by the power of the wind, wearing gore-tex and gloves and hat despite the warm air and very worried about our tent going through the night, we resolved to stash our equipment on the spot and to return to El Chaltén. It was our first face-to-face with the Patagonian wind and that afternoon we promessed ourselves not to underestimate it in the future. During that “brecha” two accidents happened. One instable boulder rolled over a climber approaching the Noruego camp and broke her coccyx whereas another climber broke his ankle sliding on the snow with his crampons on… In both cases a “rescate” or rescue was organized by the rangers of the national park with no other means than a stretcher and volunteers among the climbers (the closest helicopter is in El Calafate). In both cases it took around ten hours to carry the injured climber to El Chaltén and around 30 persons in total to take turns (the time between the accident and transport is not included). Sometimes the environmental conditions make that one has to fight hard to be able to climb, sometimes the conditions are just ideal, so that one can focus entirely on the difficulty of the climb and forget about frozen fingers, wet and overgrown cracks, bad protection, the weather forecast and nasty “tabano” flies confounding one’s nose with a runway. Coming back from Cochamó we felt that we needed a cosy place like that and after all with the weather models forecasting rain and storm for Patagonian mountains till end of December, the Patagonian “meseta” seemed a nice and almost dry place to be. The “meseta” is part of the most extensive desertic region of Argentina and was subject to intensive geological movements of elevation and lowering giving place to a stair-like landscape. 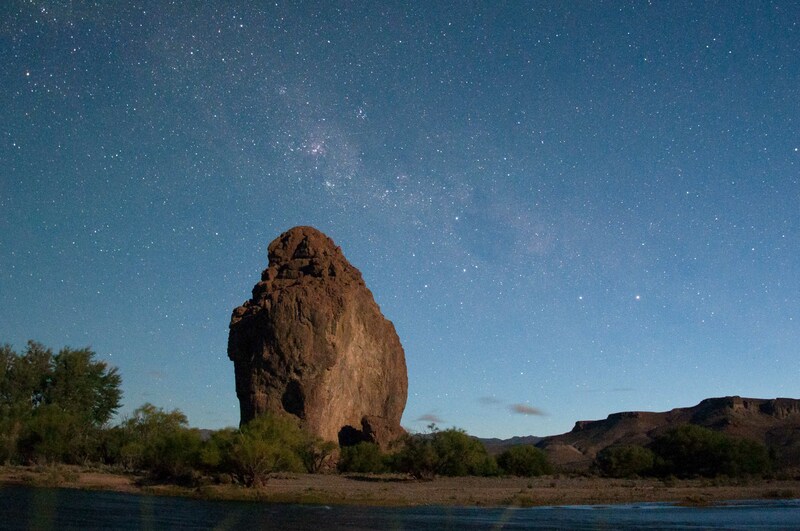 The high geologic activity in this region has also given place to a fantastical rock formation, the Piedra Parada, a more than 200 meter high freestanding monolith, whose story began 65Mio years ago. 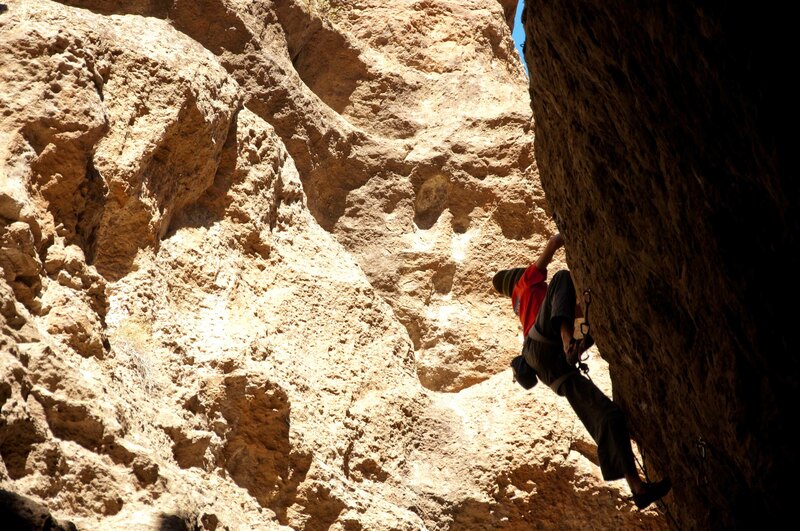 If one wants to go for the technical term the Piedra Parada is the most important “volcanic-piroclastic complex” in the region of the Chubut river. It is the leftover of a gigantic volcano with a caldera diameter of about 25km, and was active before the Andes were created. 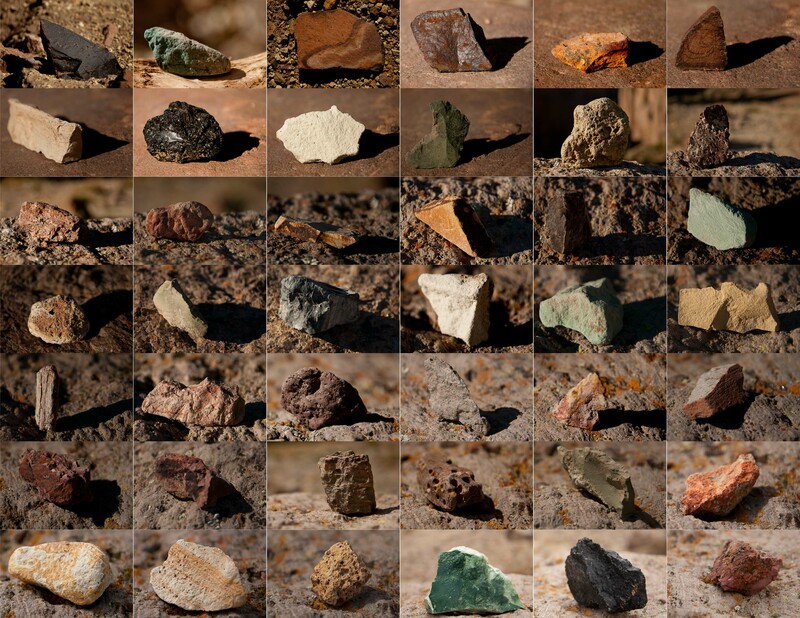 The many colors of the stones that can be found in its vicinity are witnesses of the agitaded past. During the last eruption the volcano collapsed and the lava in the chiminea cooled down and formed what is known as the Piedra Parada when the softer stone around the chiminea eroded. The Buitrera canyon lies near the Piedra Parada and is a product of erosion. Its colors and the strange rock formations must have fascinated early populations since the oldest proof of human dwellings in the region (between 5’000 and 10’000 years ago) can be found at the entrance of the canyon. 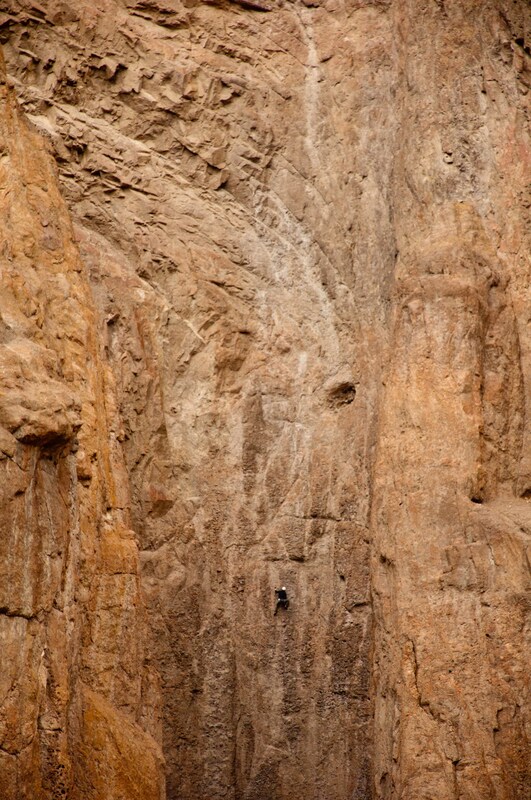 More recently a new form of live could be found in the canyon: climbers. 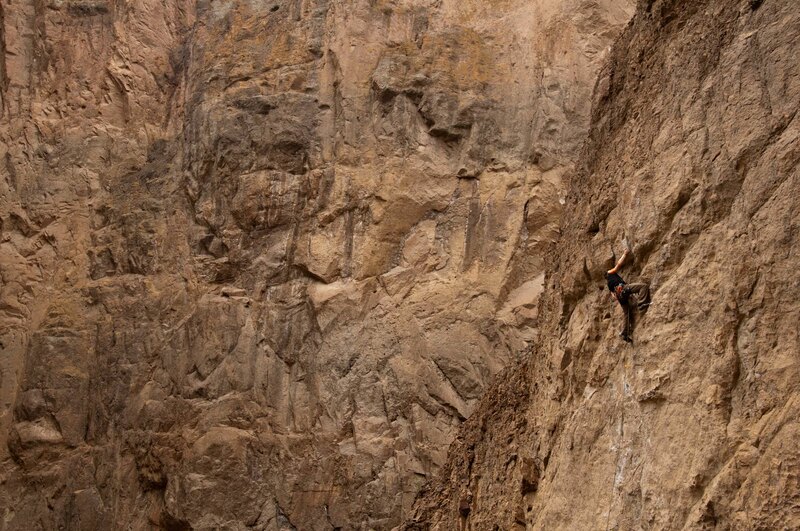 A definite climax of the population was to be found during the Petzl Rock trip in November 2012, when more than 1600 climbers were queueing for 200+ routes in the steep and richely featured rock walls of the canyon. When we arrived three weeks later, there was hardly a trace of the overpopulation, except for the brand new car of Don Mario, the owner of the camping ground. We immediately made acquaintance of the “local” climber tribe, climbers from France (Tchen and Thibaut), Chile (Antoine), Argentina (Maria and Walter), all of them spending several weeks/months in the Buitrera. 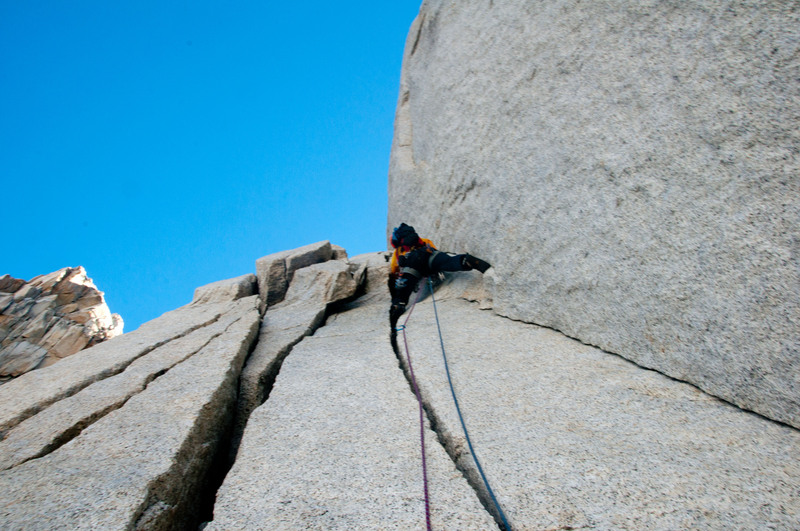 After all the trad climbing and long approches we had done lately, Louis and I had a hard time getting used to the hard sport climbing, but we learnt quickly that we could rely on the bolts and climb until you fall. Inspired by the insistence of the others we also started to work harder routes, meaning that we tried a route several times up to the moment we were able to climb it without falling. 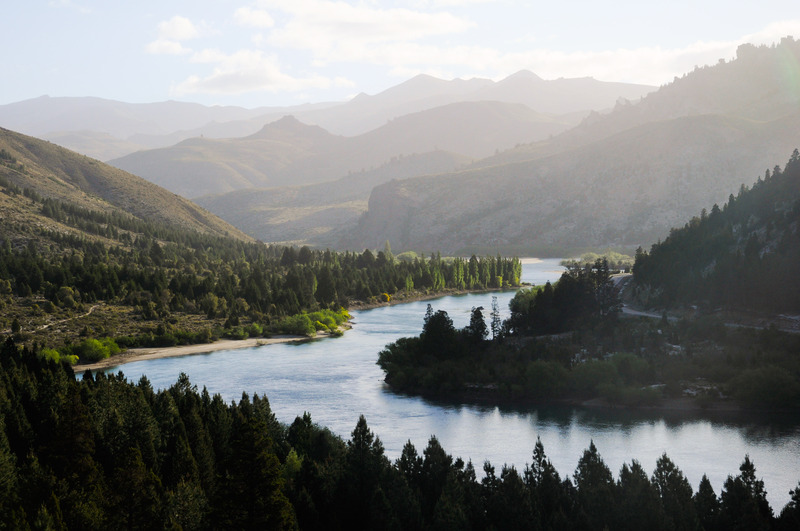 Apart from small showers we stayed dry, the wind was more than bearable, the temperatures were agreeable, we had a swim in the river Chubut every day, sat down by the fire at night sharing our exploits of the day. We finally again felt mentally prepared for a harsher environment and during our stay the weather situation had improved in Patagonia, nothing could contain us now from heading to El Chalten! Once upon a time, there was a land without a name. Vast spaces devoid of people, stepplike plains, glaciers, fjords, deserts, lakes, impenetrable forests, canyons, mountains. Nomads called Tehuelces travelled these boundless spaces from east to west, following their hunting habits. Magellanes was the first European to encounter them in 1520 and he was so astonished by their average height of 1m80 that he gave them the name “Patagons”, after the giant in the novel “Primaleón” that appeared in 1512 in Salamanca, Spain. (The European average at that time was 1m50). In the centuries that followed, the Mapuches, another indigenous tribe with its origins in today Chile, slowly displaced the Tehuelces due to their superiority in war techniques and the use of the horse brought by the Europeans. For the central government in Buenos Aires the Mapuches though signified an important resistance against the advance of the Hispanics in the 17th and 18th century. Nevertheless this resistance was broken with the “Campaña del Desierto” in 1879, a war against the indigenous population with the aim of colonialising Patagonia, resulting in a genocide of 20’000 people. During all times, Patagonia attracted the people. First Englishmen appeared in their conquest of the seas during the 16th century, then European scientists thirsty for new discoveries in the 18th and early 19th century, then missionaries that brought the cross and finally exiled people who did not have any other place to go. After the “Campaña del Desierto” in the 19th, the land was distributed to soldiers and landlords from Chile, Yugoslawia, Wales, Poland, Scotland, Denmark, England and Holland. The few indigenous people that survived the war were enslaved. 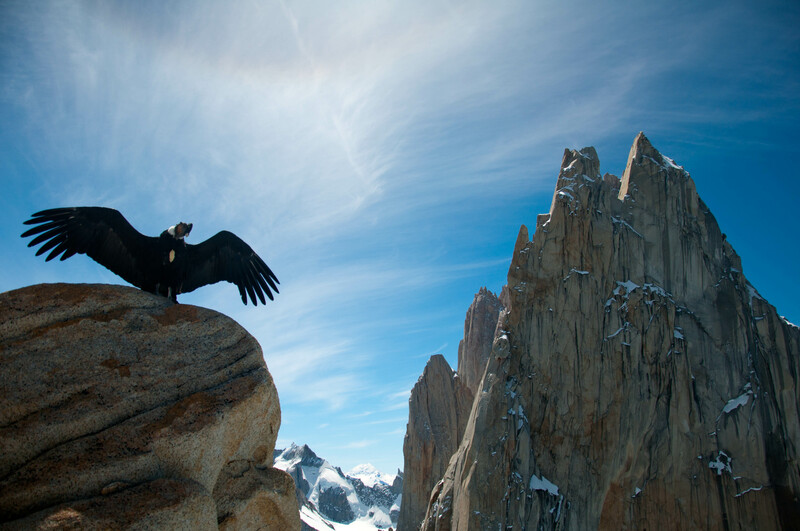 About twenty years ago a new race of conquerors appeared in Patagonia, the millionaires. With their fortune, they could acquire large parts of land in very little time: Patagonia has become a topic at the table of the rich. But before anybody is able to buy land, someone needs to sell it. 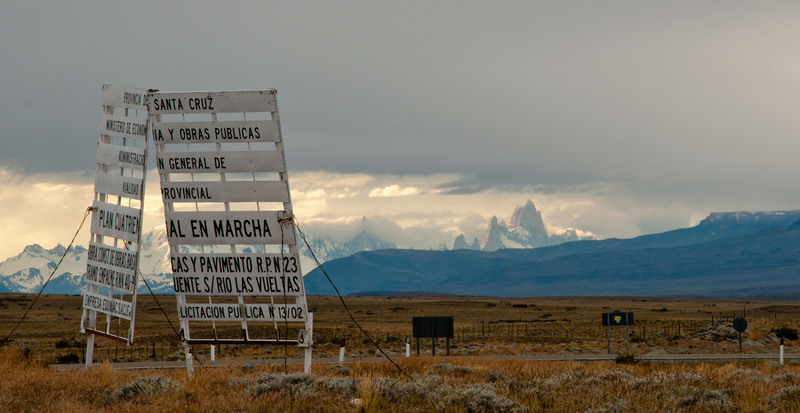 The local government played an important role in selling Patagonia to foreign investors. They kept silence when indigenous communities claimed land they had been cultivating for years and in other cases they gave crucial information to the potential buyer (for example about the original owners of the ground) as if they were an real estate agency. It is not a surprise that many officials really opened their own real estate agency after leaving the public sector. 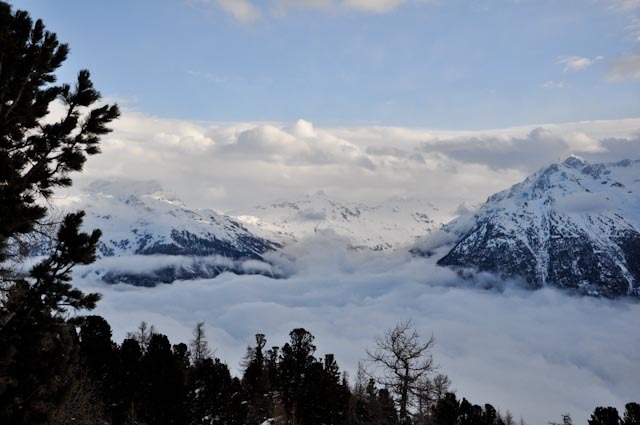 Between 1996 and 1998 a particular government official authorized the sale of 8 mio hectares near the boarder region, which corresponds roughly to twice the surface of Switzerland! (Selling real estate in a area within 50km from the boarder has to be authorised by the state.) Even nowadays a clear policy on the subject of selling homeland is missing and many people fear for the sovereignty, the environment, the rights of indigenous populations and simply for their future; but Buenos Aires is a long way from Patagonia and although that part of the country is important economically (gas ressources, wool and meat production, mining, tourism) the number of voters is bigger in a single suburb of Buenos Aires than in the whole Patagonia with a population of 2 millions people. 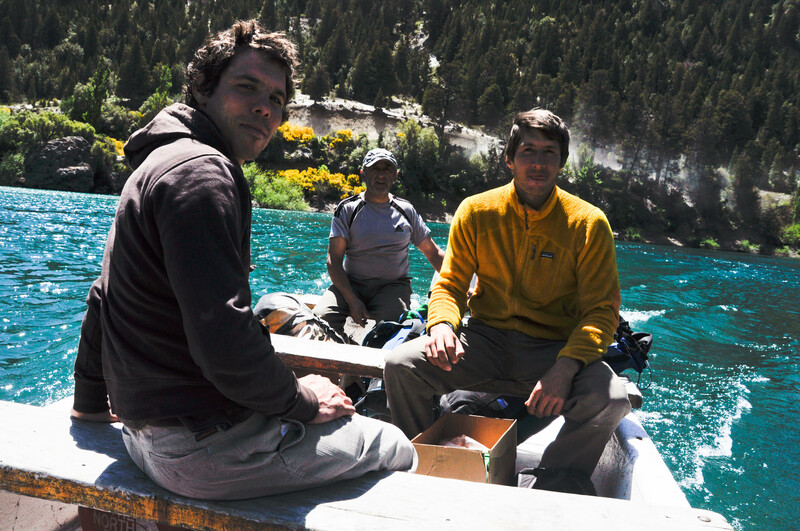 The four biggest foreign landowners in Patagonia own a terrain big as half of Switzerland. On a larger scale, 10% of the surface of Argentina (270’000km2) is owned by strangers (2006). The Benetton family, known for its textile industry, possesses more than 1 million hectares and it is the biggest landowner in Argentina beside the state. It is one of the major producers of wool and pork meat in Argentina, but also it is involved in forest managment and less publicly advertised because of the environmental issues, in mining. 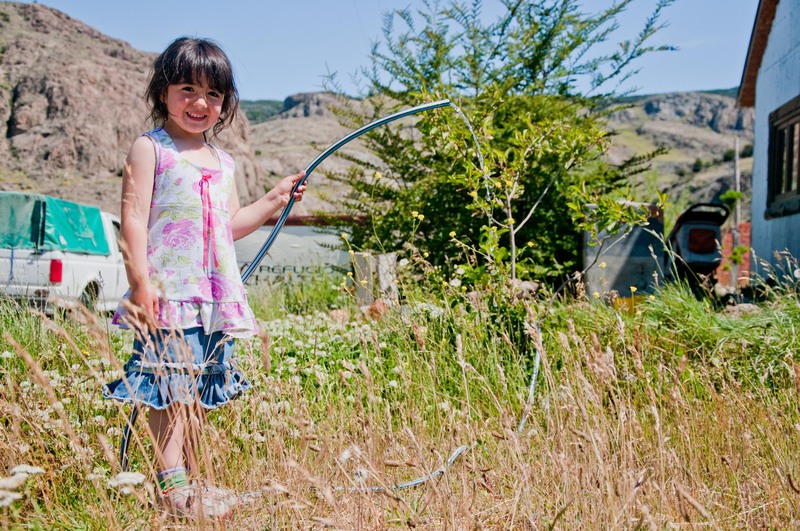 The family members consider their land as an investment which has to give a return. In 2002 a scandal with a dislodged Mapuche family biased the sales and the image of Benetton. By offering 2500 hectares to the indigenous community, the conflict could be mitigated (the land was restitued only in 2007), however tensions continue up to the present day. Douglas Tompkins, who travelled Patagonia in young ages and even opened a route on the Fitz Roy, made his fortune as founder of The North Face and Esprit brands. He is the biggest private owner of natural resources in Chile and received the nickname of “Lord of the Water”, since his lands are situated on top of an incalculable amount of ground water. 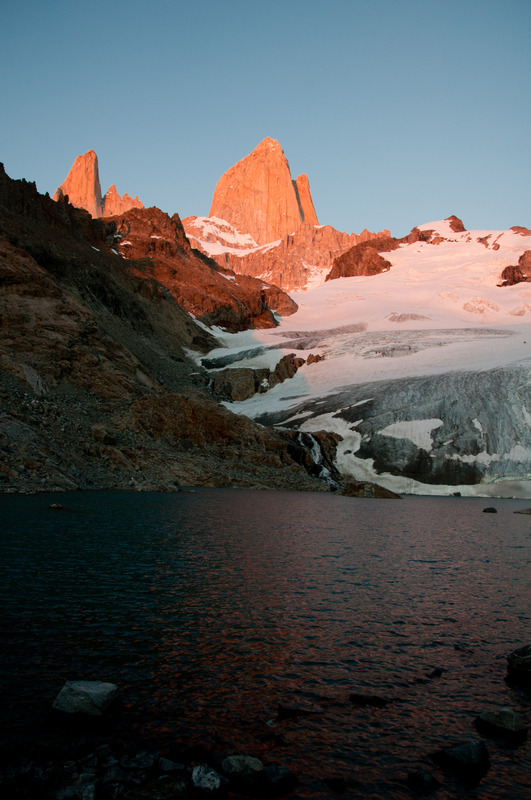 It is said that Patagonia shelters one of the main reserve of fresh water in the world. In the south of Argentina and Chile he owns more than 900’000 hectares, principally with the aim of nature preservation, in the sense of “Deep ecology“, a movement which propagates the return to the nature, much in contrast with the idea of some Chileans to populate the land to the very last bit. His territory cuts Chile in two parts which created considerable controversy. Rather than investing in a private jet, he buys more land in order to protect it. Much of his land has now the status of natural park and in Argentina his land donation to the state is among the biggest in the Argentinean history. Ted Turner, media mogul and founder of CNN bought more than 40’000 hectares pushed by his passion for trout fishing. He is also among the biggest owners of private land in the USA. Joseph Lewis, 6th richest man in the UK in 1996 due to his activities in restaurant chains, golf courses, textile industry, biotechnology, gas extraction, etc… built his own paradise near El Bolsón: an entire lake of 600 hectares encircled by mountains, hidden in a forest of Alerce trees, many of them older than 4000 years. His property extends over more than 14’000 hectares. He is heavily contested by some inhabitants of the region and loved by others. Nevertheless, he has been polishing his image with gifts to the local community such as hospitals, emergency vehicles, libraries, an aerodrome, scholarships and good salaries so that locals gave him the nickname of “Tío Joe”. Way Lard, the grandson of the inventor of the chips, owns the chips company Lay and Pepsico Inc. and makes big profits with VIP tourism and vineyards. The list of foreign landowners is infinite, some are certain (Jacobo Suchard (Nestle), Swarowski family, etc. ), some are just rumors (Silvester Stallone). 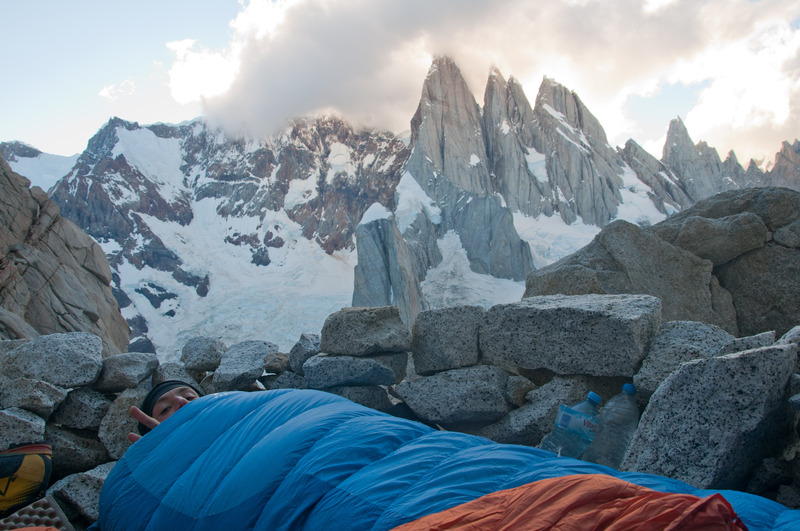 Finally, Patagonia has always been owned by strangers. And as the former president Menem put it “Lo que sobra en Argentina es tierra” that is “There is land to be wasted”. As a matter of fact, we also experienced at first hand what private property in Argentina means. 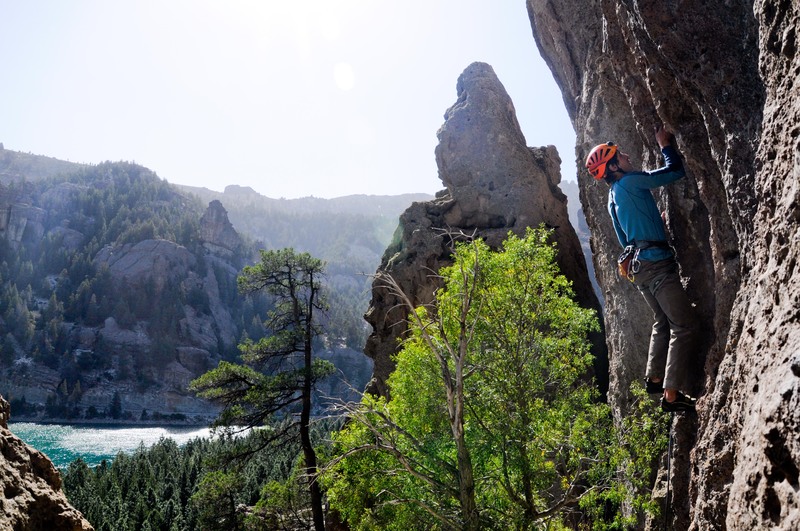 Every now and then throughout our trip we heard about a climbing paradise near San Carlos de Bariloche called “Valle Encantado” (the enchanted valley). Rumors about a river crossing with an inflatable boat, a compulsory permit to enter the private ground and an interdiction to camp made our undertaking as difficult as would be the climbing of the tower of the “Rapunzel” occupied by a short haired princess. We started with what seemed to be the easiest one of the three quests that had been imposed on us: the permit to enter the private property. The magic crystal ball (internet) told us to go to the “Club Andino Bariloche”, the local mountain club, where they gave us only a telephone number which never answered, a dead end. In the different sport shops that we inquired we only obtained a vague description of an office that we could not find. It was as if some dark power would put obstacles in our way, we were getting crazy! Finally a phone call to a contact that we had obtained two weeks earlier in a shop in Salta (!) could solve it. We finally found the ominous office, but it was already closed that evening. The next day we were supposed to leave, having solved none of our quests but we still had a distant hope of reaching our paradise. We were already sitting in the bus station waiting to be driven to our plan B climbing spot Villa Llanquin when the miracle happened: out of boredom we started to ask in the tourist office whether they had heard of Valle Encantado, only the be provided with the crucial information of what phone number to call for the permit, how to cross the river and where to find a place to spend the night. We had found the fairy godmother! After some phone calls everything was arranged. After all we decided to spend a day in Villa Llanquin, waiting for Adrien who we had met in Arenales to join us and then headed together to Valle Encantado. Adrien in the meantime was able to obtain the permit to enter the private ground. 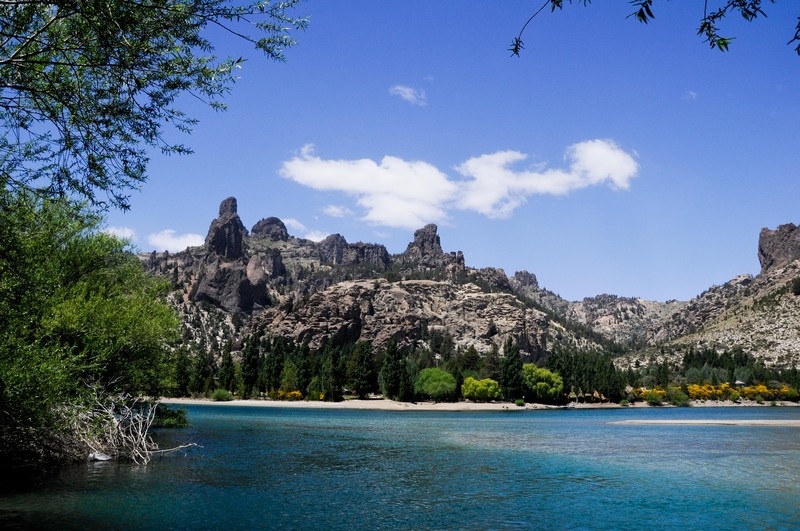 On the next day, we took the bus to km 1201 on the “Ruta 40” and were dropped along the river opposite to some vacation cabins for rent and above all opposite to the incredible natural rock sculptures of Valle Encantado. We cried and whistled trying to find out the magical saying that would awake the ferryman and finally we were successful. Luis, the guardian of this little paradise made us cross the turquoise river to the “estancia” consisting of some central buildings such as a winter garden, some verandas with big fireplaces, a house for the “asado”, a chapel, a kitchen and the more remotely located wooden holiday cabins. We chose one of the cabins and headed directly to the property next to the one we were, where the actual climbing areas are located. 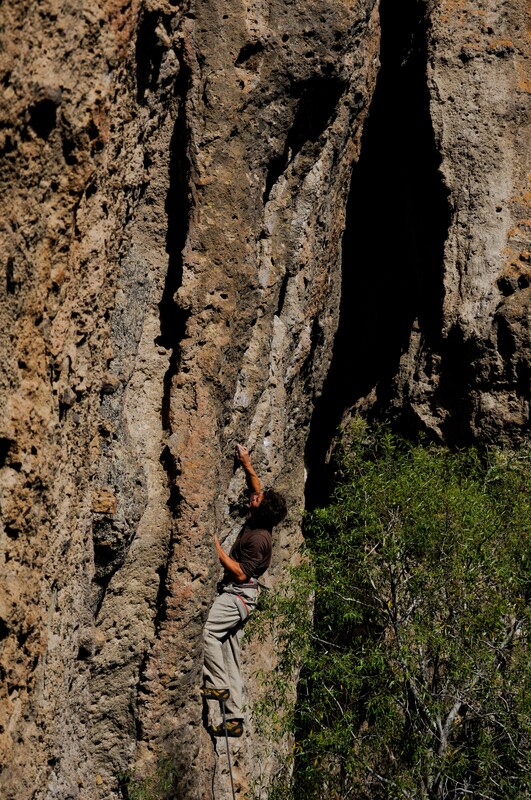 We spent the next few days climbing these incredible vulcanic rock formations and enjoying the little paradise of Valle Encantado situated next to the beautiful river Limay. All the climbing is on the other side, but how to cross? 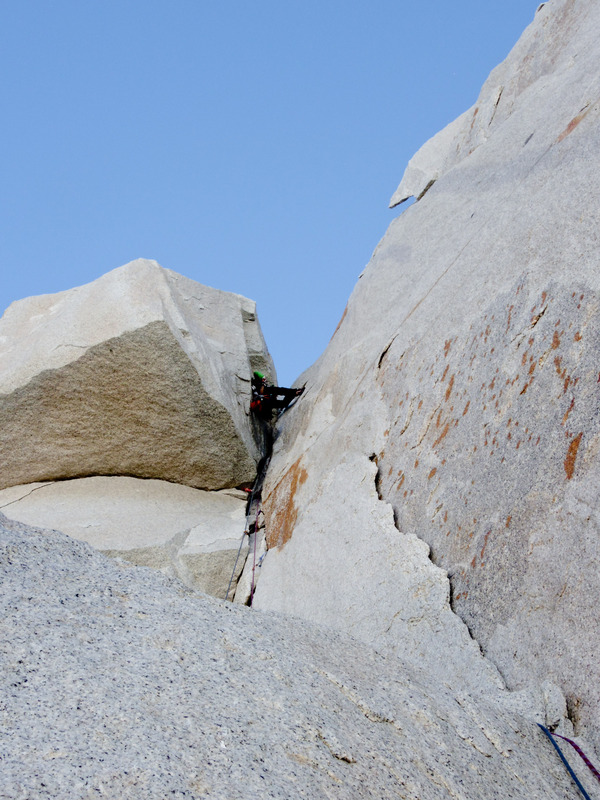 The fairy tale should end here: the three brave climbers found their enchanted rockwalls, had hot showers every day and slept in real beds every night. But as we learned later, the “estancia” is the property of the Van Ditmars, a family that has its origins in Holland and is also known as a big seller of Patagonia. Van Ditmar people were often leading the negociations between local landowners and the magnates (Joseph Lewis, the Benetton family) willing to acquire land in Patagonia. On top of the reward for the negociations, the Van Ditmar family is now administrator for many big landowners. 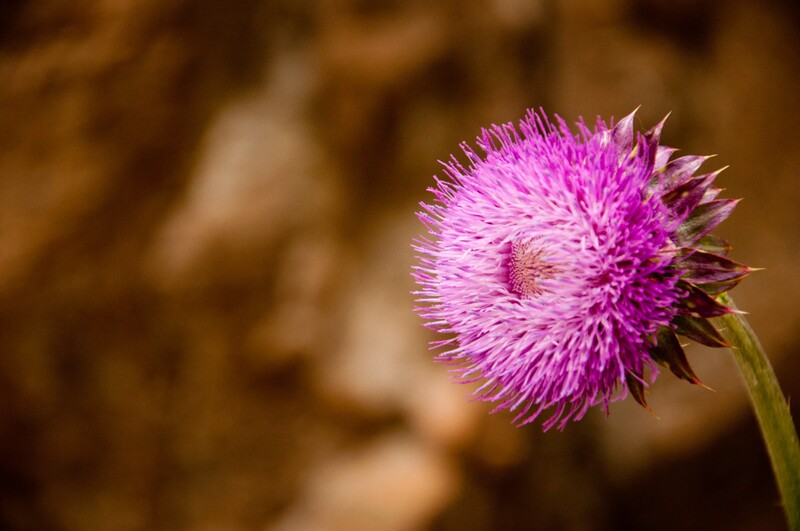 In the particular case of Valle Encantado it is said that Van Ditmar acquired it from an old lady in exchange of a flat in the city, a property that is now worth several millions of dollars… that is how it works in Argentina! PS. 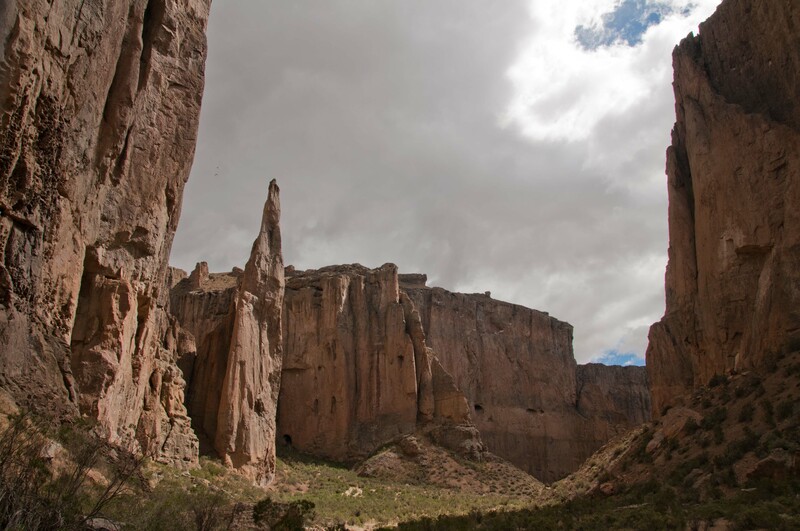 Our experience in the Valle Encantado was very positive, although there is something I did not mention before. In June 2011 the volcano Puyehue erupted and covered large parts of Patagonia with a thick layer of ash. Half of the cattle of the affected areas died and the rest has a diminished life expectancy. Valle Encantado has been greatly affected by the eruption as well. The whole place was covered with a layer of up to 30cm of very fine ash. When the winds blown in Patagonia as they often do, the sight is obscured by the flying ash, a natural disaster which will take at least 15 years to disappear. Some more pictures can be seen here. Gonzalo Sánchez, “La Patagonia vendida”, Marea Editorial, 2006. Wikipedia, “Patagonia”, 16. Dez 2012. Chile and Argentina are so long that we, geography idiots, had to simplify things a bit to orient ourselves. We assumed both countries to be one-dimensional and directed along a north-south axis. In addition we defined four reference cities (somewhat relevant to our climbing destinations) regularly spaced along that axis: Salta/Antofagasta, Mendoza/Santiago, Bariloche/Valdivia and El Chalten. The distances between the reference cities could be expressed in km (around 1500 km) or in bus hours (15 to 20 hours). But luckily you do not need to use this memorizing trick. From your computer or smart phone you can just take a look at the Google maps at the end of each post and scroll Argentina/Chile up and down. From Tuzgle to Los Arenales we first headed south-east to Salta (which evidenced the fact that our initial assumption was wrong since it took us almost 9 hours to get there). The road descending from the Altiplano crosses over beautiful landscapes. The valley sides reproduce endlessly the same erosion patterns and alternate variously coloured sediment layers whereas the valley bottoms are carpeted with lush vegetation. 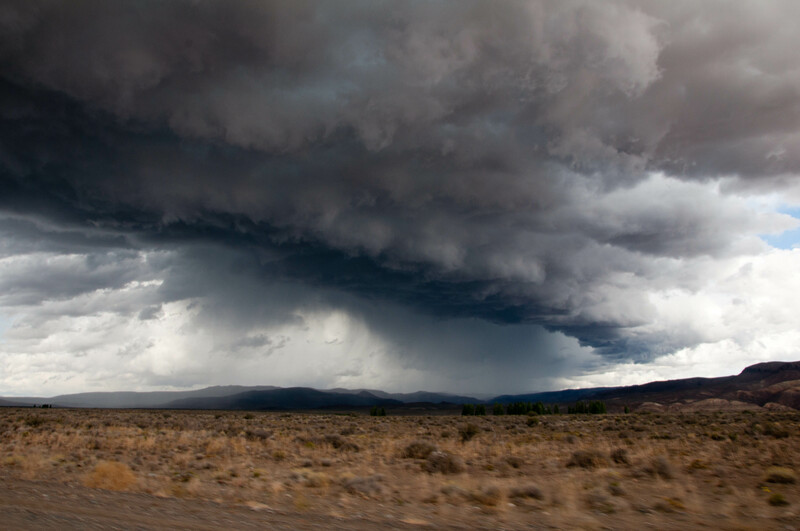 In Salta we experienced rain again after one month of draught before moving down a notch on our imaginary map to Mendoza and 150 km west of Mendoza to Tunuyan in the heart of Argentinean wineyards and orchards. In Tunuyan we went round and round to find a grocery store open during the siesta time (2 pm to 5 pm) with little success. We drove the last 70 km to Los Arenales with Yagua, a “gaucho” and taxi driver for climbers from Manzano, a small village at the foothill of the Andes and for our sake with a shop open during the siesta time. Manzano changes its face on weekends when hundreds of “mendocinos” flock to Manzano and spend the day grilling next to their car, wandering in the streets, riding horses or eating ice creams. 12 km away from Manzano on a gravel road the “refugio” of Los Arenales awaits the climber. It is set down on the valley bottom like a spatial module with its half-cylindrical roof and its patchwork construction of wood beams, concrete and metal sheets. In the background monumental fans rise on the valley sides. 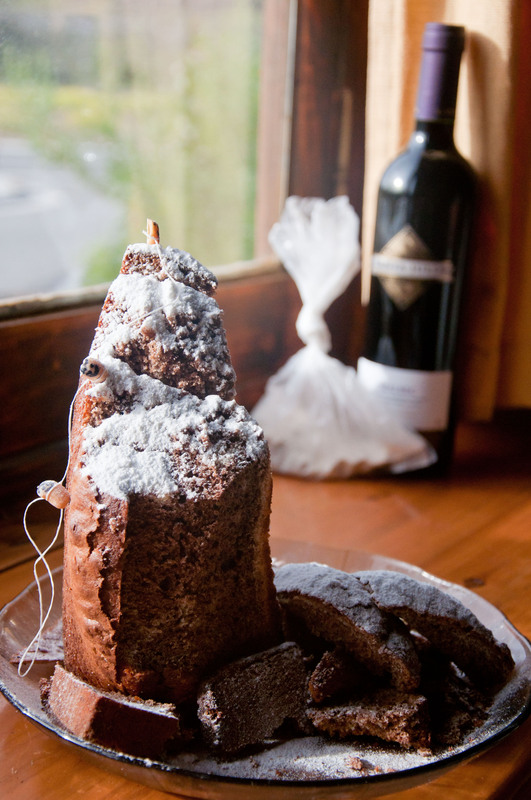 The “refugio” is not guarded but in spring and summer it hosts a joyful and always renewing troop of climbers. The occupants at the time of our arrival were: an American couple and two American guys, all staying in Los Arenales for more than one month and growing goodly beards, a fluctuating group of Argentinean guys, generally returning from their climbs at night, two Swiss from Massongex + three French guys from the Pyrenees, on their way to the Petzl Rock trip, an Argentinean couple of half-professional climbers, leaving for El Chalten and a good weather window and last but not least hordes of tiny birds and mice exploring the “refugio” in search of food. The spring had not completely taken hold of the place since it had been snowed 40 cm in the preceding days. 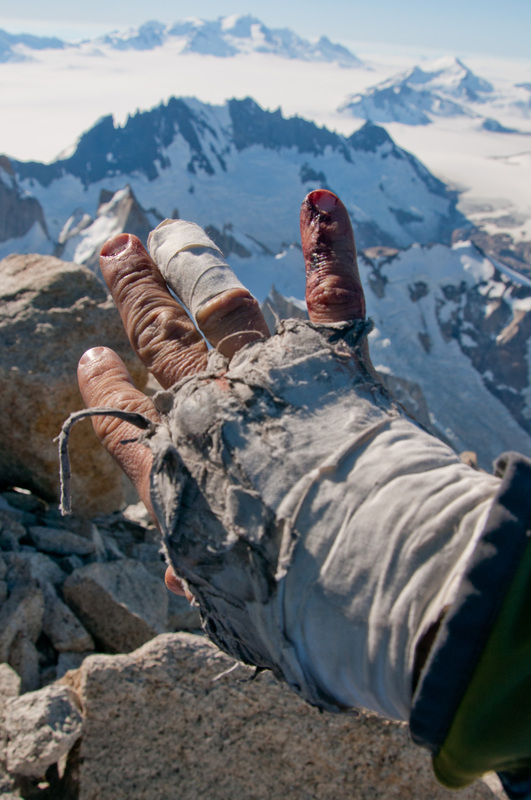 Nights were still cold and despite the strenuous approaches the first pitches in the morning often turned into local anaesthetics for the fingers. 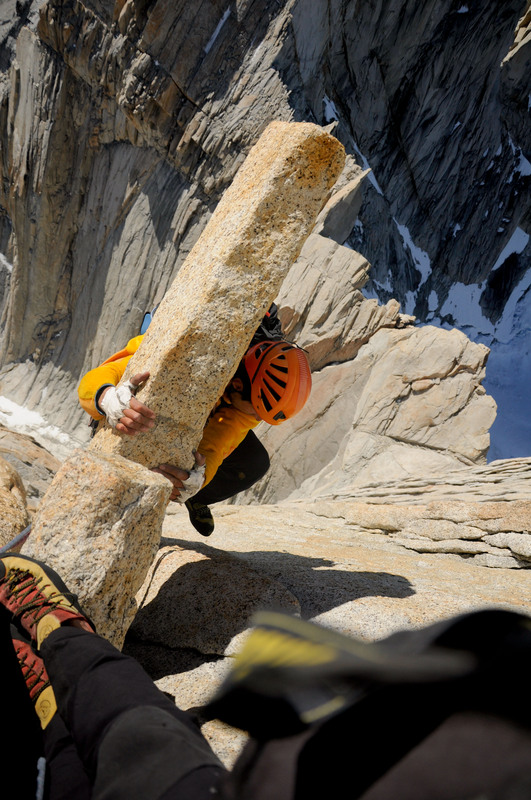 The wind was blowing hard over the tops of the massive granite spires bordering the valley. 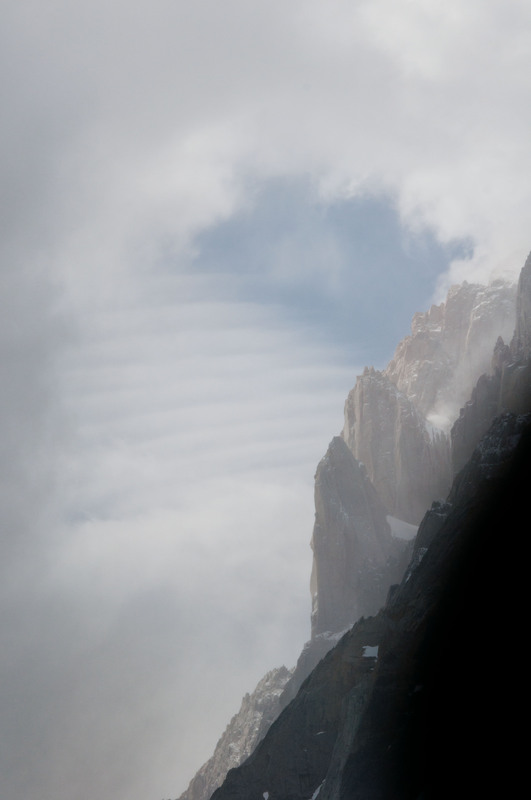 Whereas the cracks, dihedrals and ledges made up our playground, the clouds were putting on a show in the void next to us, billowing up the steep walls, tearing off on sharp ridges and swooping down deep gullies.